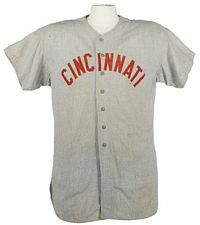 Home jersey has a "C" on the left chest. 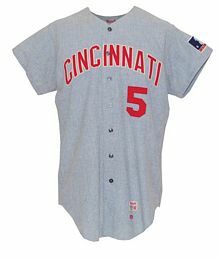 Road jersey is navy with "CINCINNATI" across the chest. 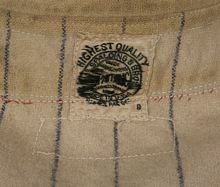 White home cap, navy road. Home jersey now has "CINCINNATI" across the chest, road jersey unchanged. 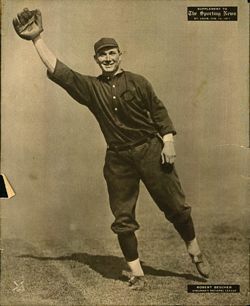 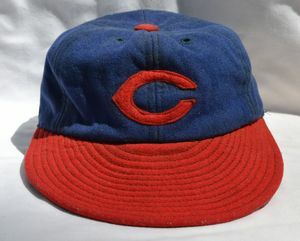 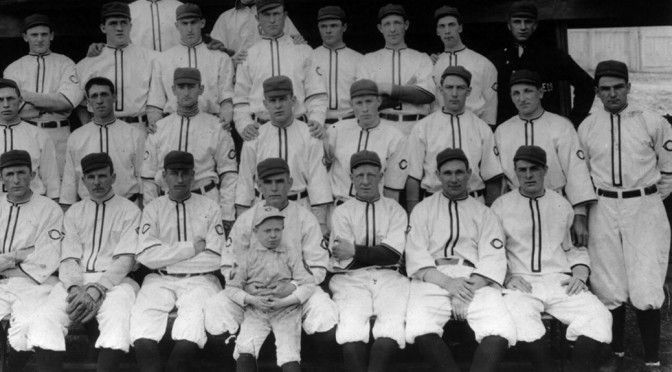 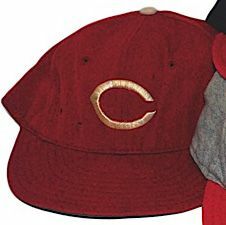 Home cap red in 1901. 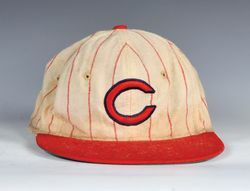 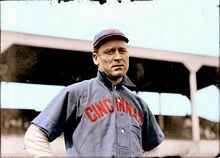 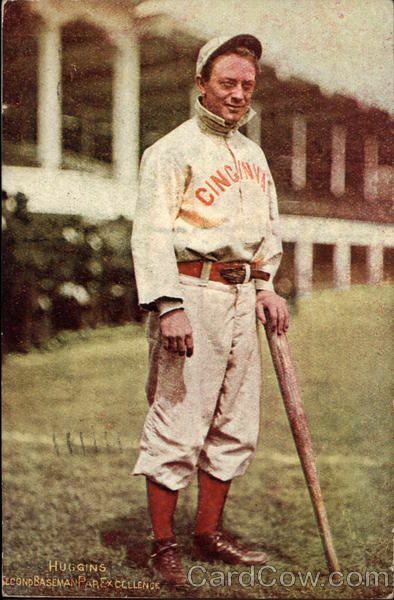 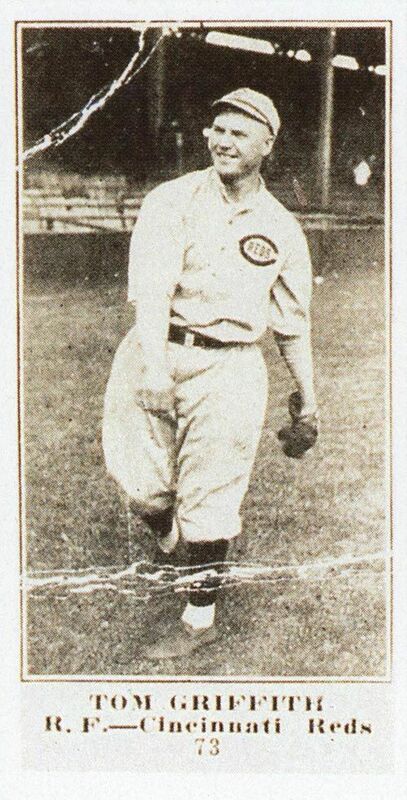 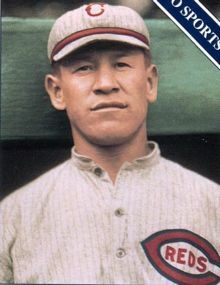 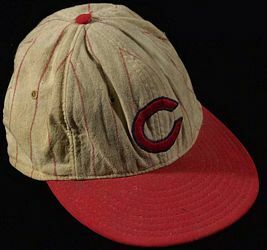 Home cap changes to red with white pinstripes in 1902. 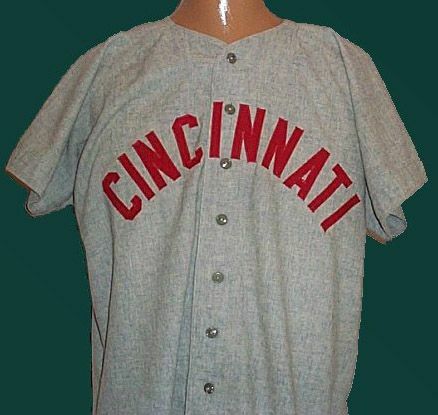 Home jersey gets a wishbone "C". 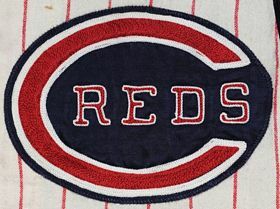 Home jersey "C" is rounded. Home jersey "C" is larger. Home jersey "C" moved to sleeve. 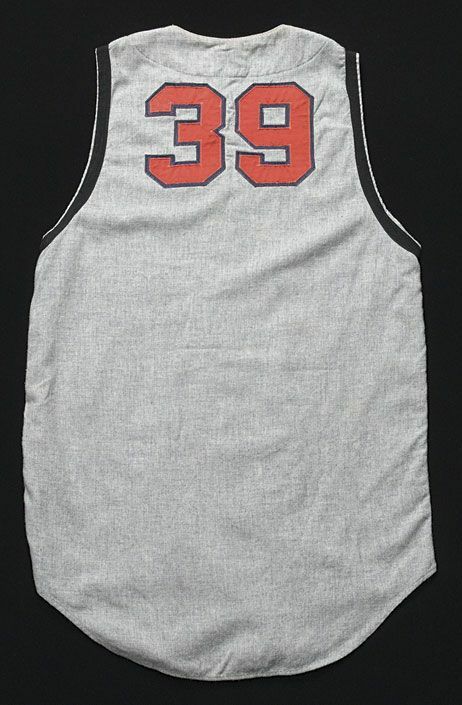 Road jersey is navy. 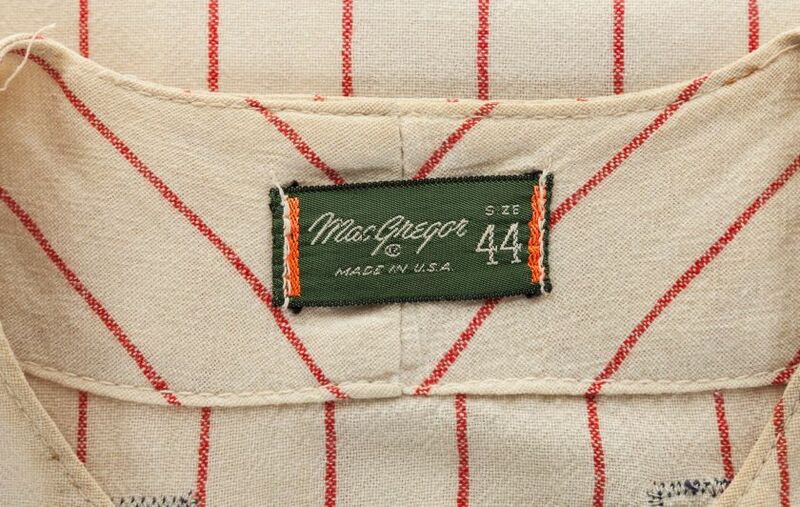 Piping added to home jersey placket. 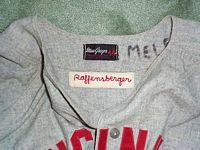 Wishbone "Creds" put on left chest of both jerseys. 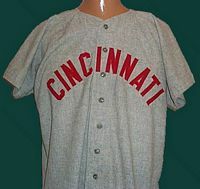 Rounded "C" on both sleeves of home white, road grey jerseys. 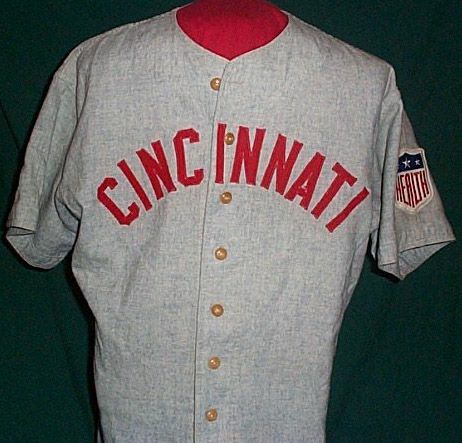 "CReds" returns to left chest, road jersey is navy again. 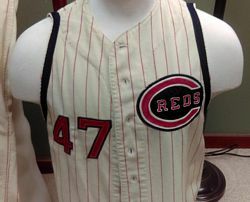 Pinstripes added to both jerseys. 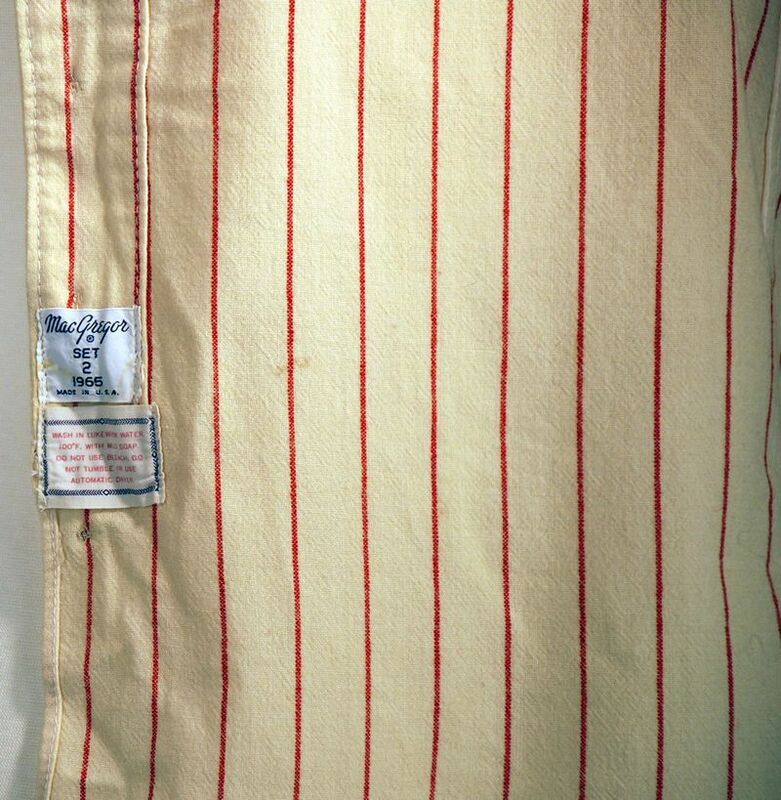 Road shirt stripes are thinly spaced. 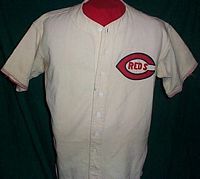 Placket piping removed from home shirt and logo altered a bit. 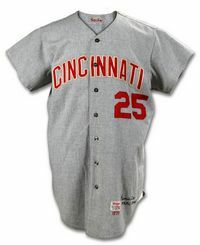 Road jersey is grey without a logo, then a "C" is added to the sleeve during the season. Logo wishbone is flattened, and is added to the road jersey. 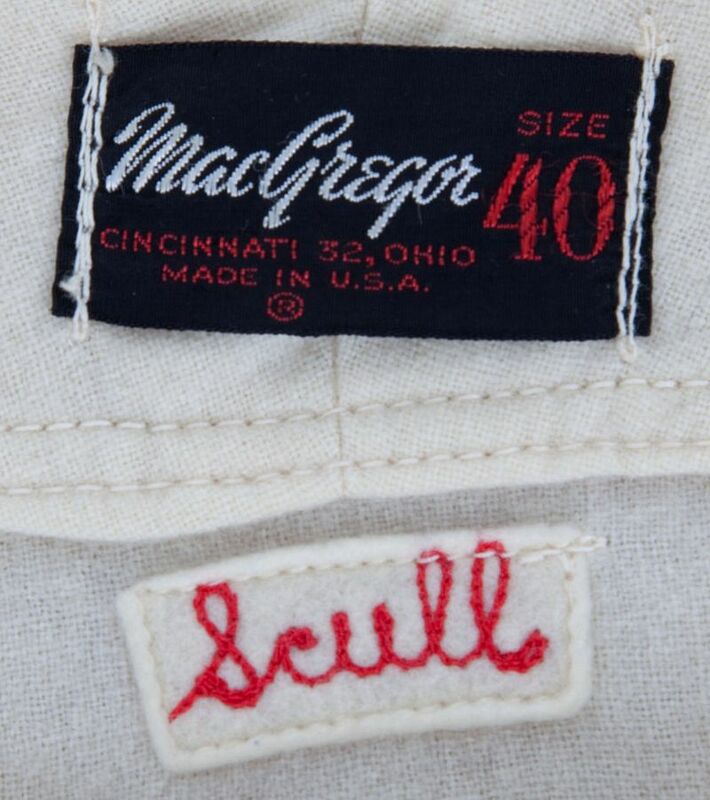 Logo gets navy outline. 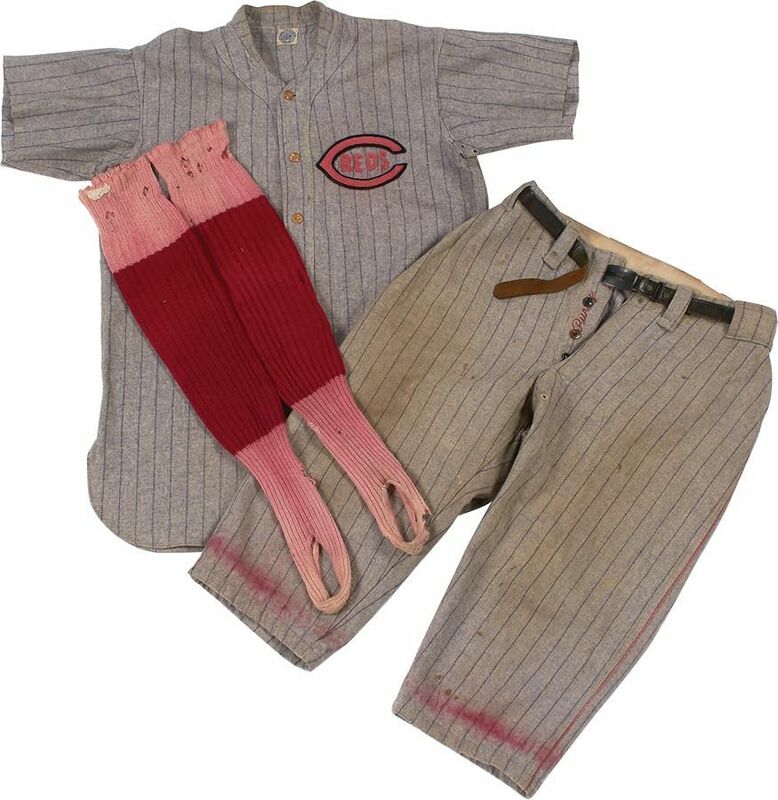 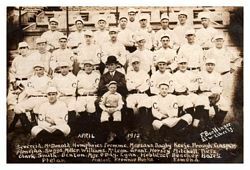 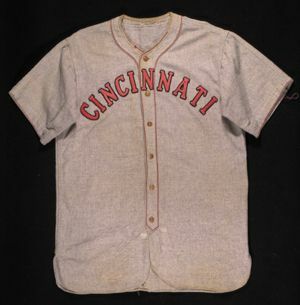 HOF database shows the 1917 home without pinstripes and navy trim, but here it is. Pinstripes dropped on home jersey. 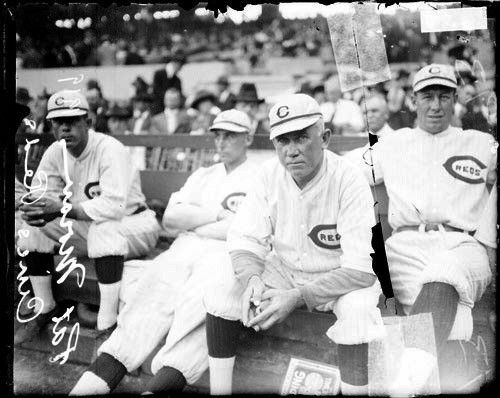 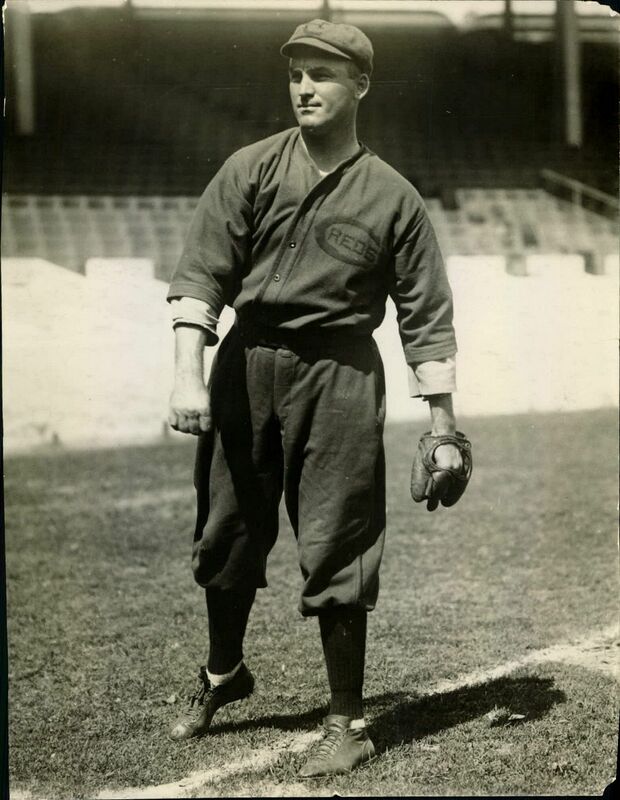 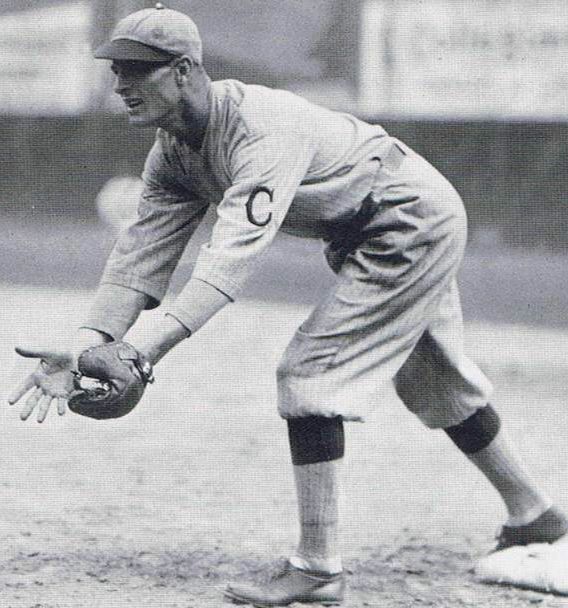 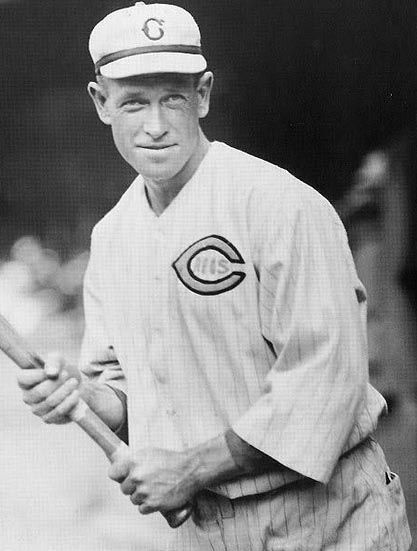 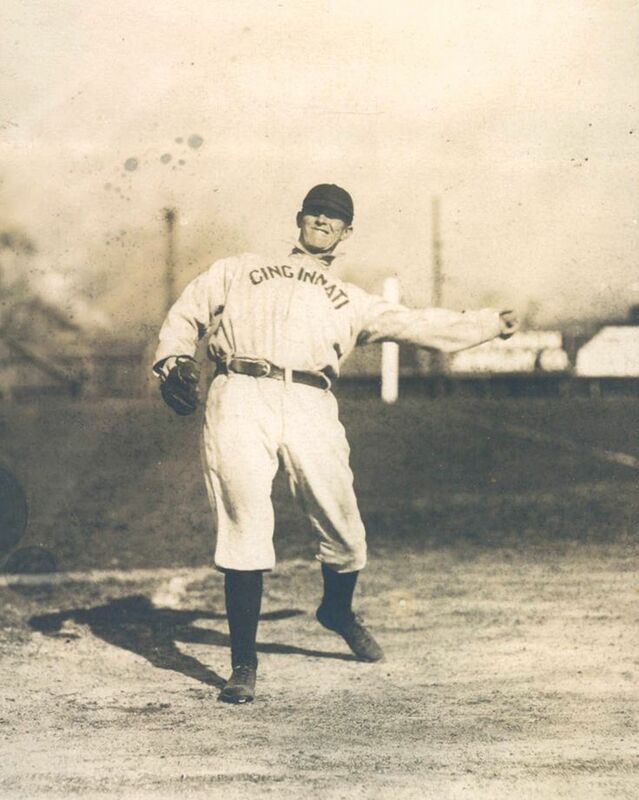 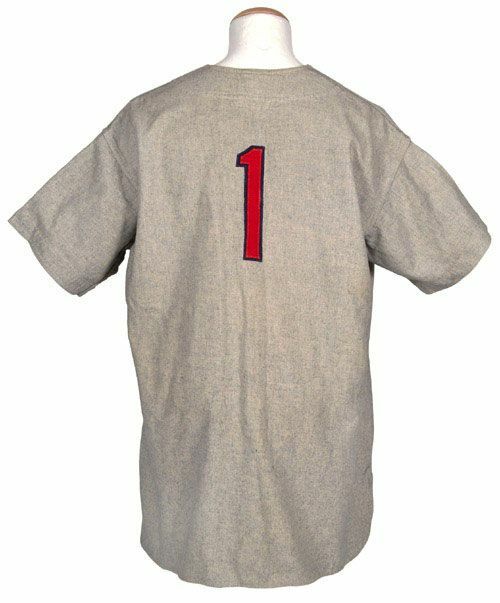 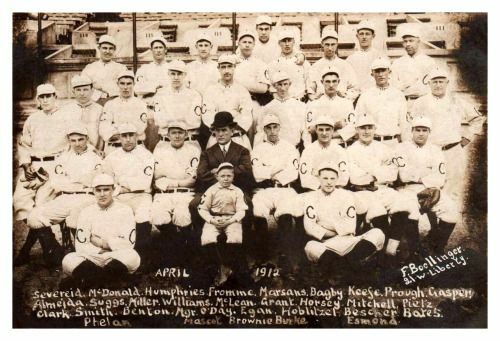 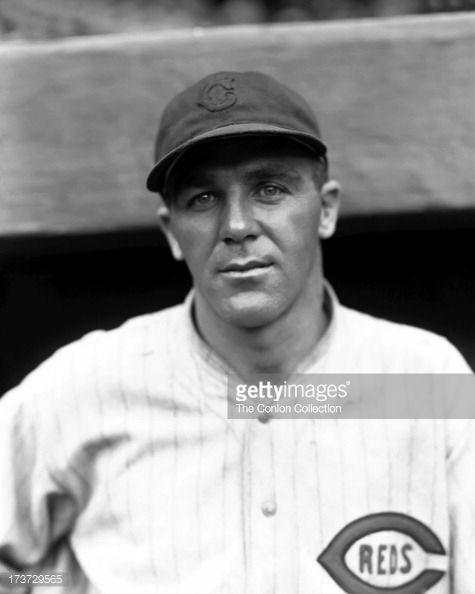 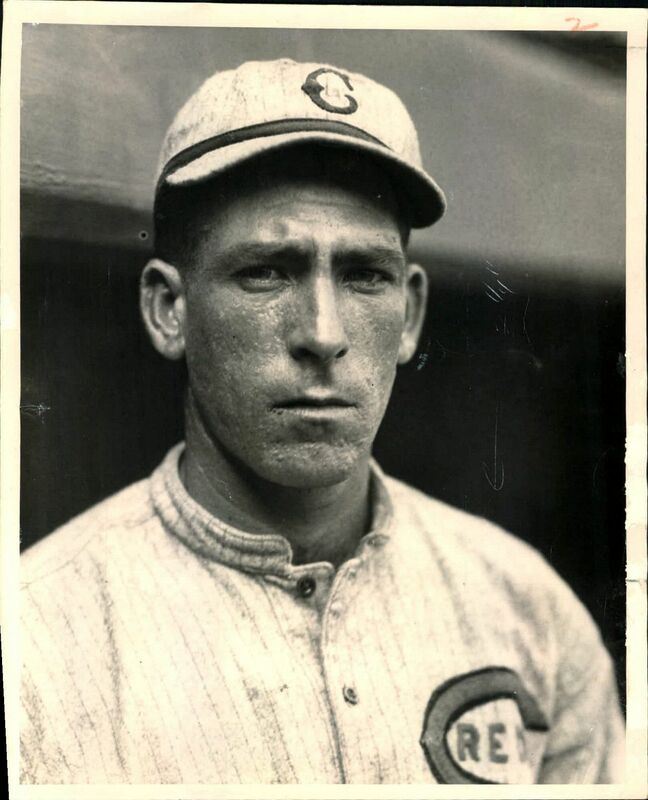 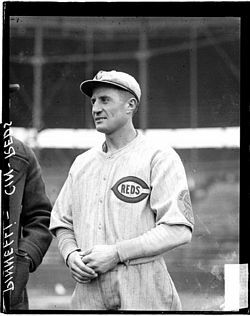 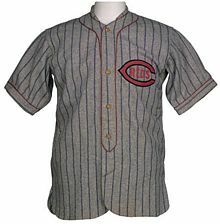 For the 1919 World series, a new set of pinstriped jerseys with a more open "C" is used. The home jersey logo is trimmed in navy. 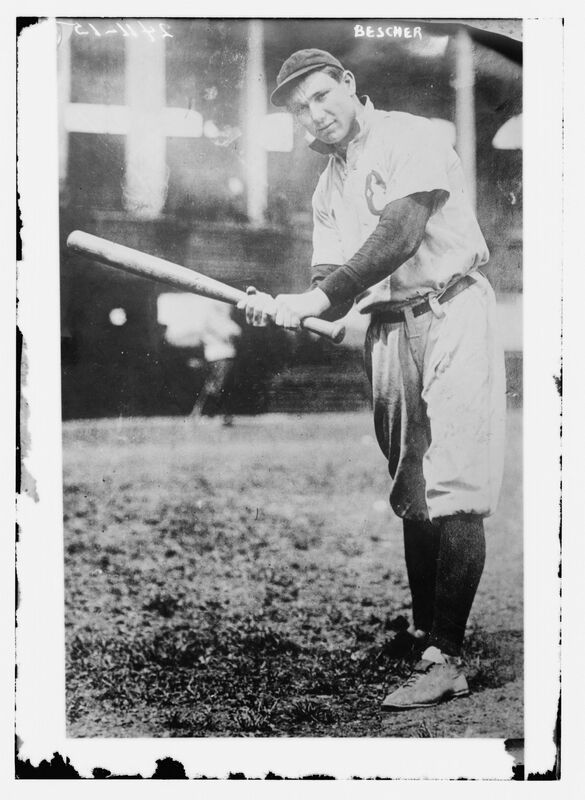 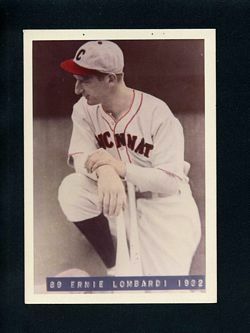 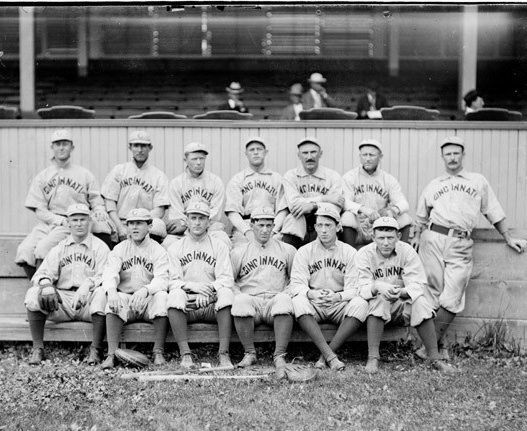 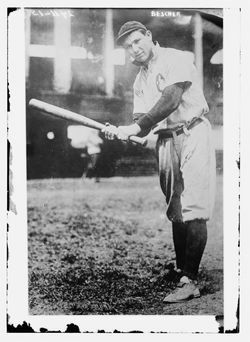 Both 1919 sets are used in the 1920 regular season. 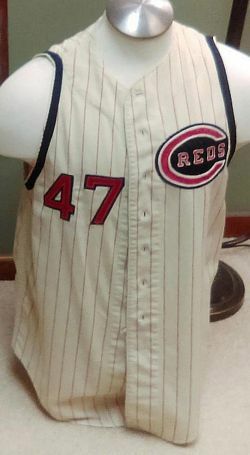 Road jersey pinstripe spacing widened to match home and red trim added at base of the sleeve cuff. 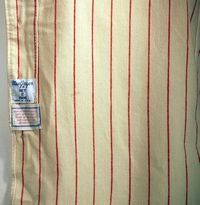 Pinstripes added to home jersey. Red sleeve and placket trim added to both. 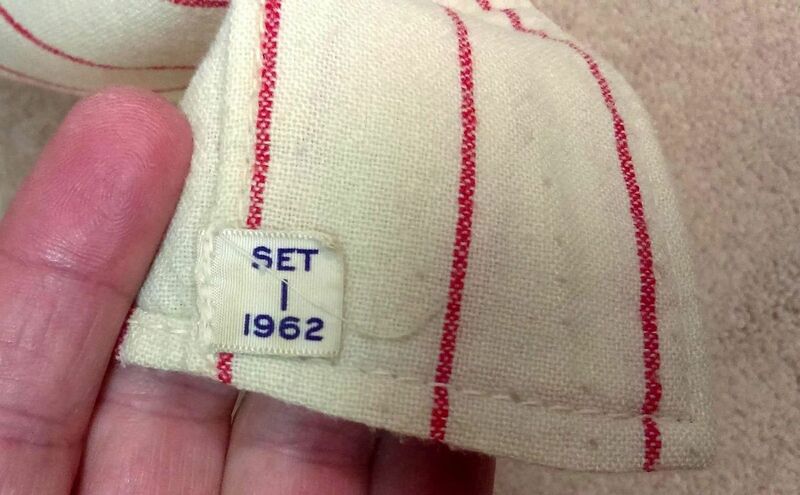 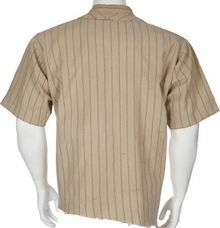 I haven't been able to find this sleeve cuff striping in photos to accurately date this jersey. 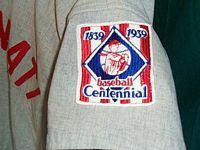 Golden Jubilee patch worn in 1925. 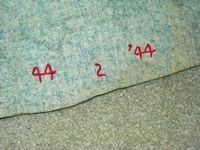 Sleeve trim moved to bottom of cuff. 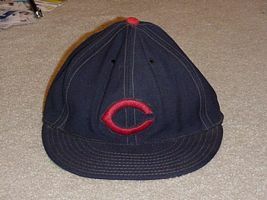 Cap changed to navy. 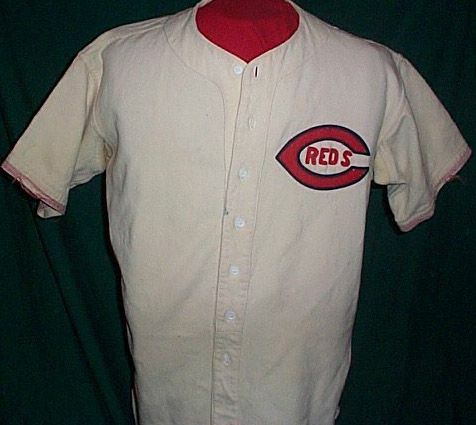 Placket piping gone from road jersey. 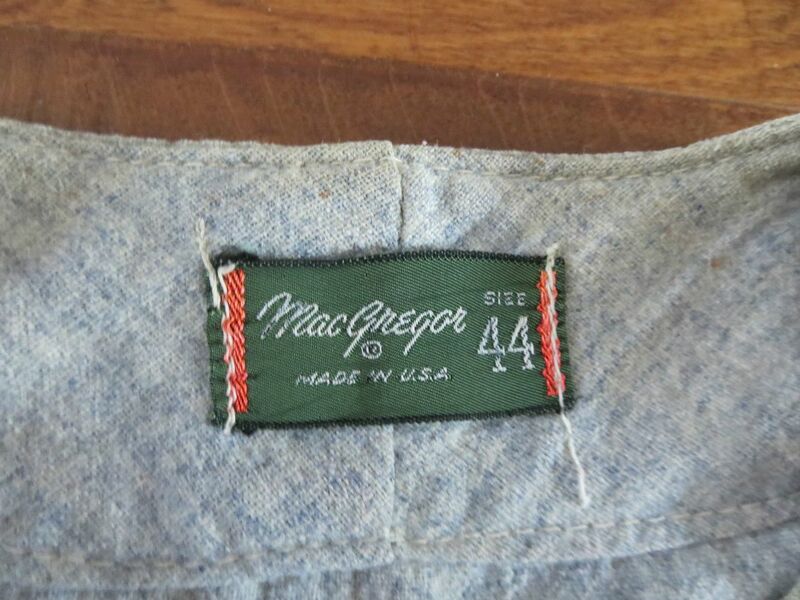 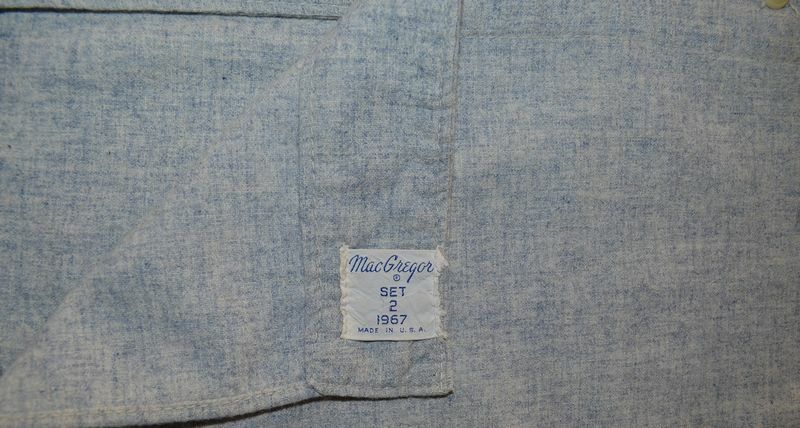 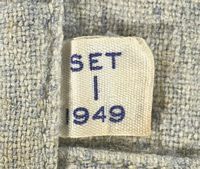 Note sleeve cuffs (and trim) have been cut off. 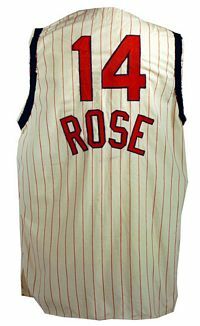 Pinstripes removed from road jersey. 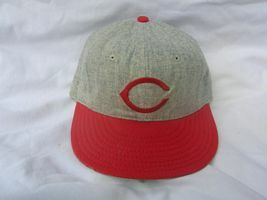 Home cap white with red pinstripes, road solid grey. Logo replaced by "CINCINNATI" on road jersey. 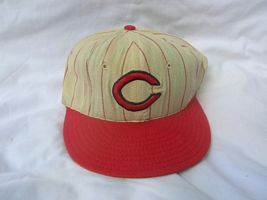 Home cap is white with pinstripes, road cap grey. 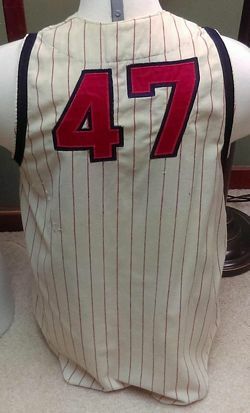 Pinstripes dropped from home jersey. 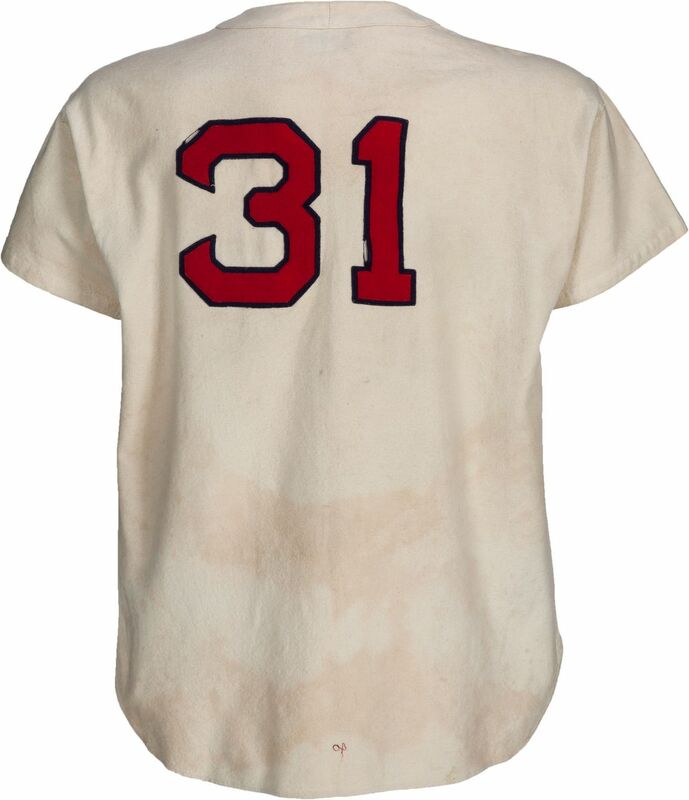 Numbers on backs added. 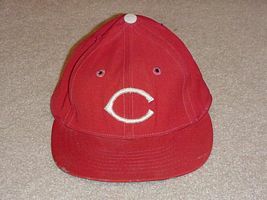 New cap logo. Home cap white, road grey. 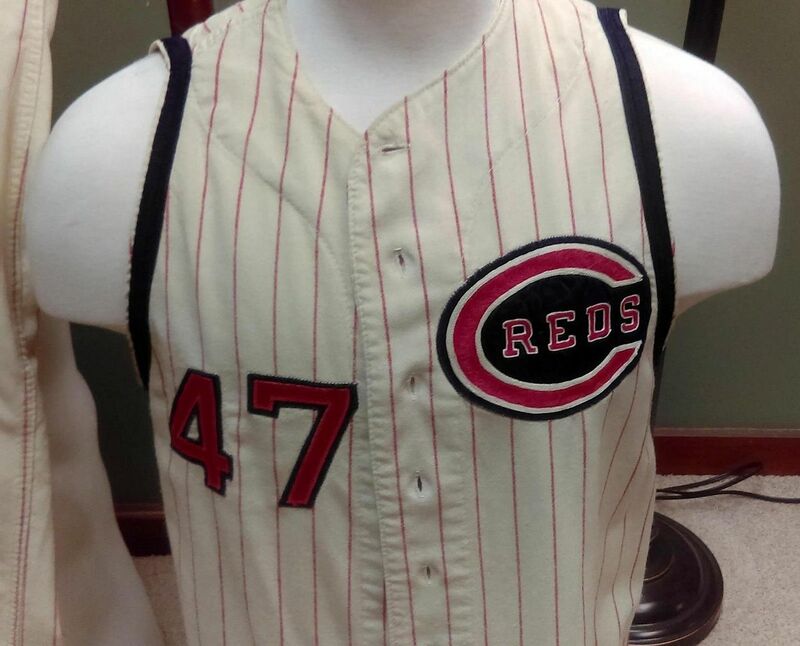 Front piping dropped, "REDS" added to sleeves of road jersey. 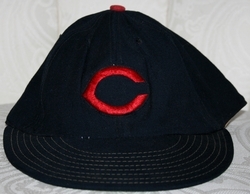 Cap logo changed to wishbone "C". 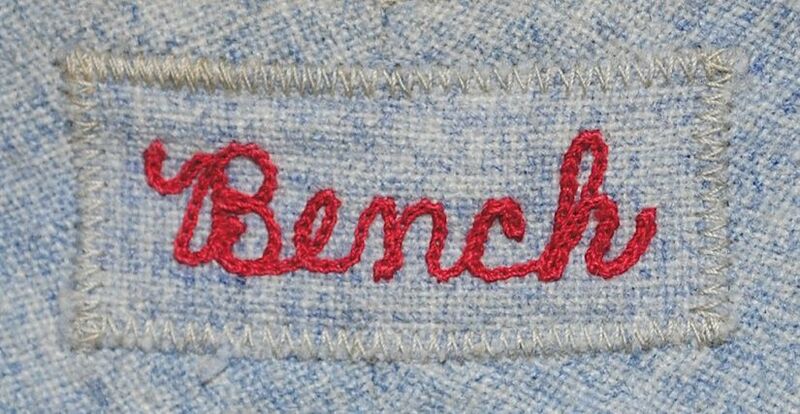 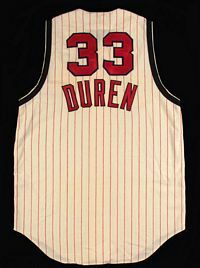 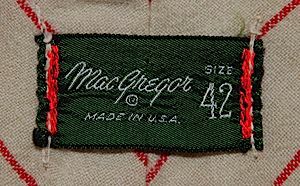 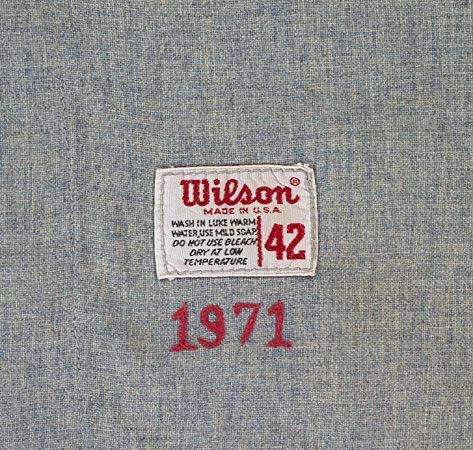 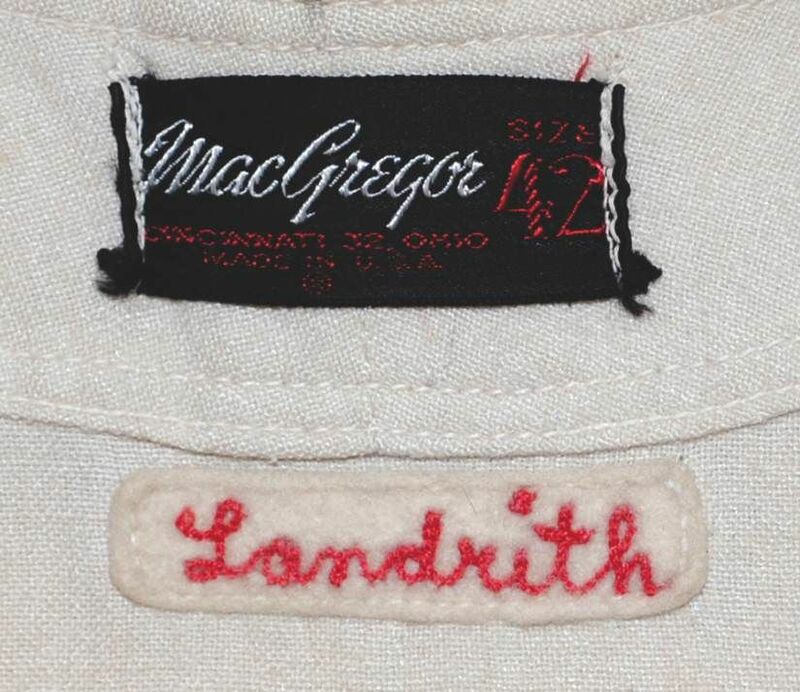 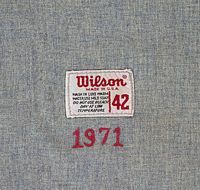 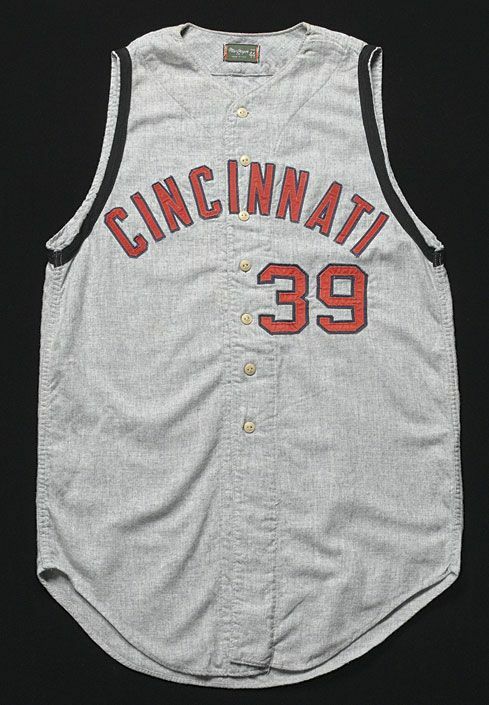 Road font changed to wide Tuscan, "REDS" dropped from sleeve. 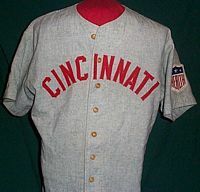 Home is solid white with red piping, logo is a navy wishbone C with red inside and "Reds" in navy. 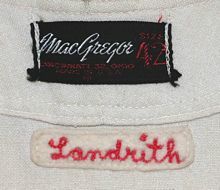 Road is grey with red piping and the same style logo. 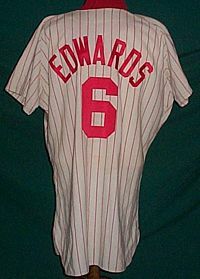 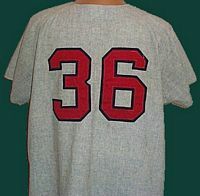 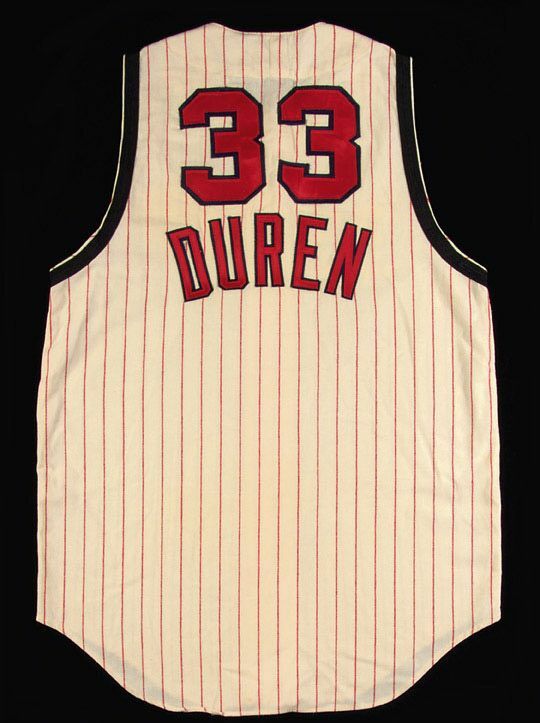 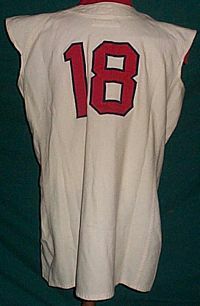 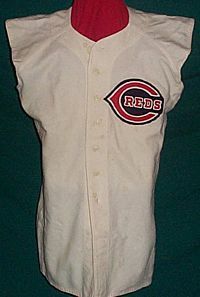 Alternate introduced, worn with red or white pants and white cap. 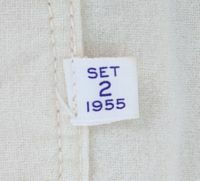 The set reverts to the 1935 style. 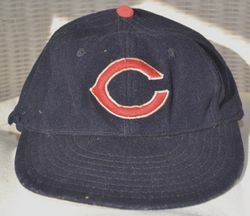 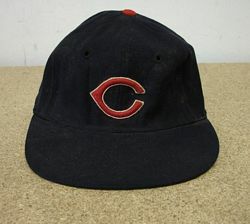 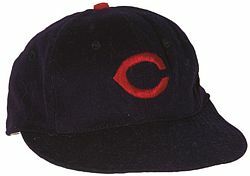 The 1936 alternate is reused, but with the new navy/red bill cap. New style debuts. 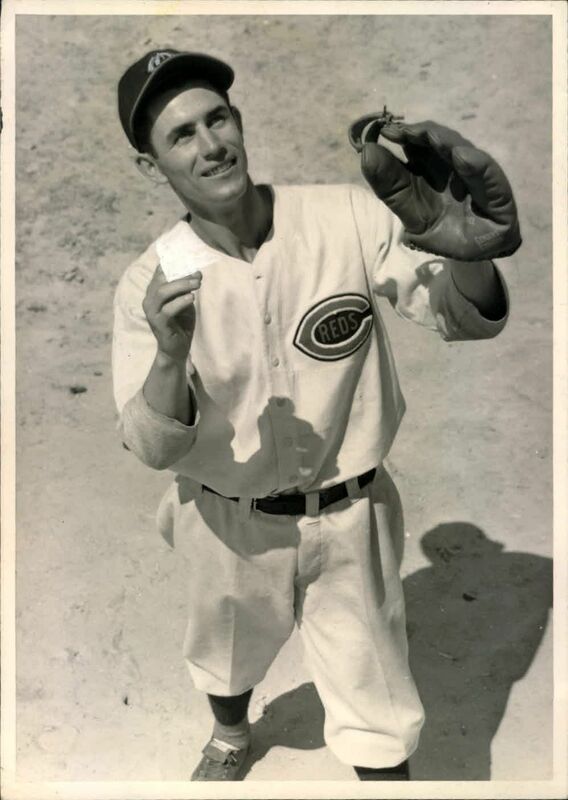 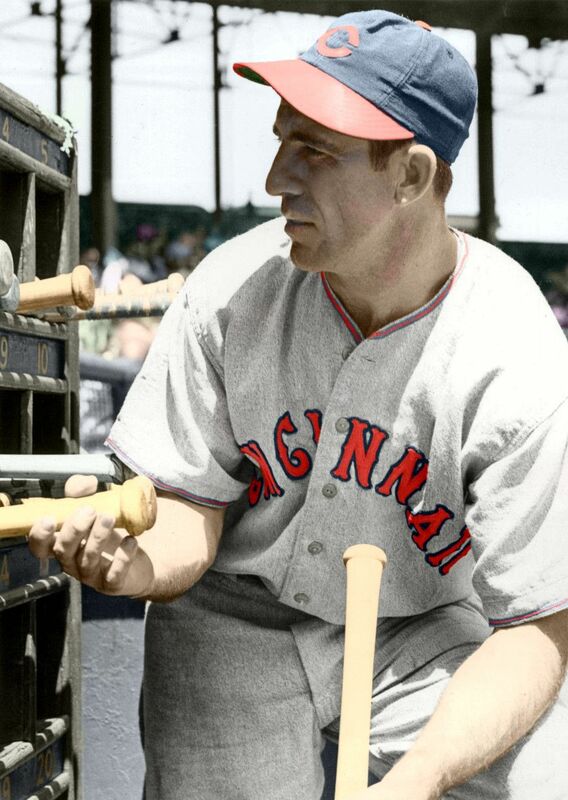 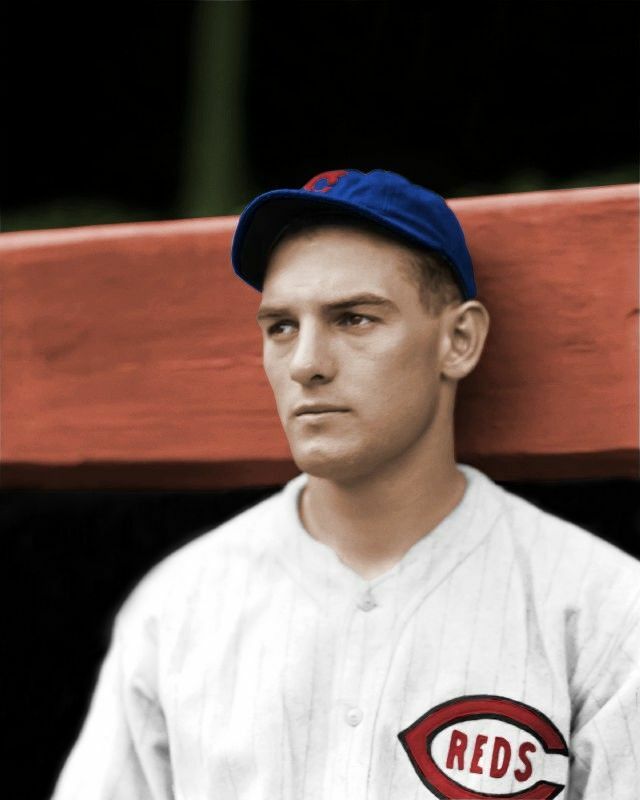 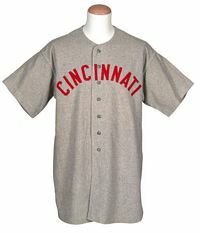 The first 1939 home jerseys had no white trim around the logo on the front. 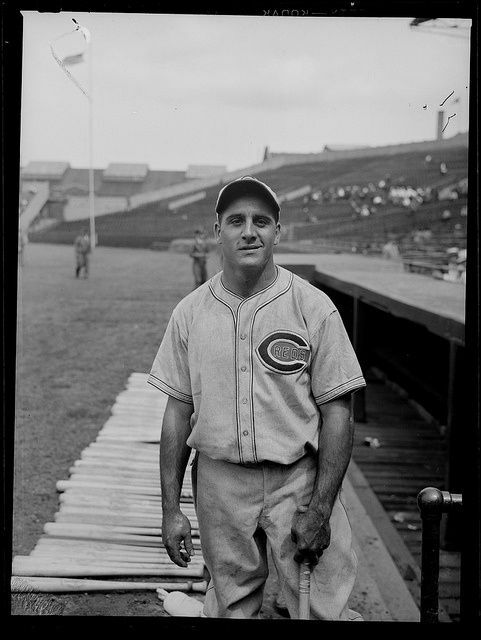 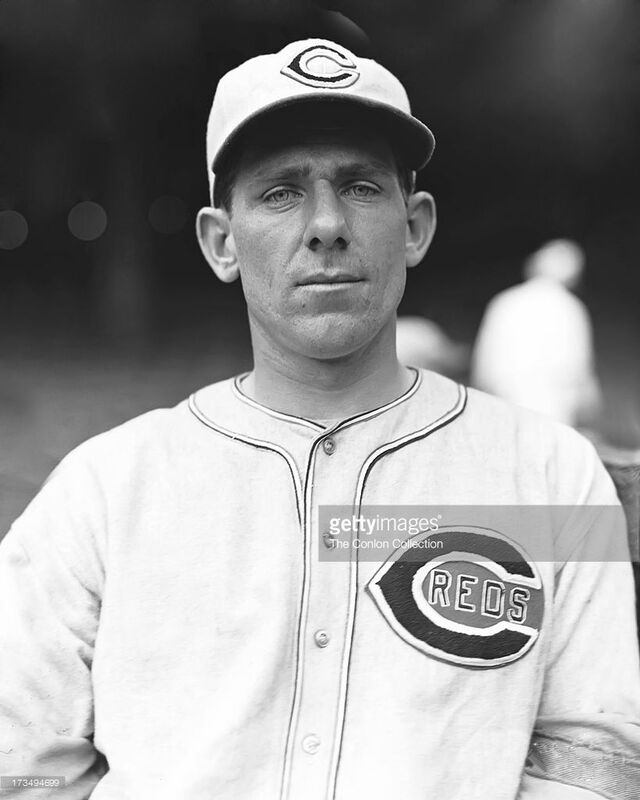 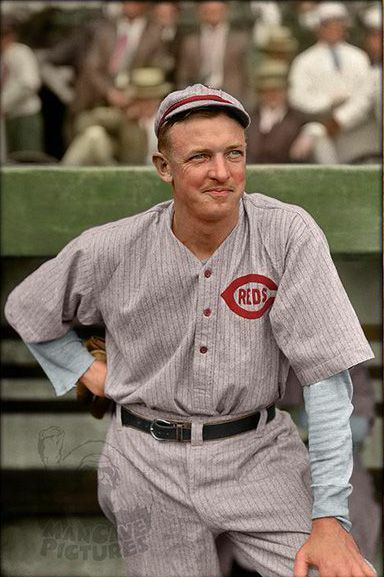 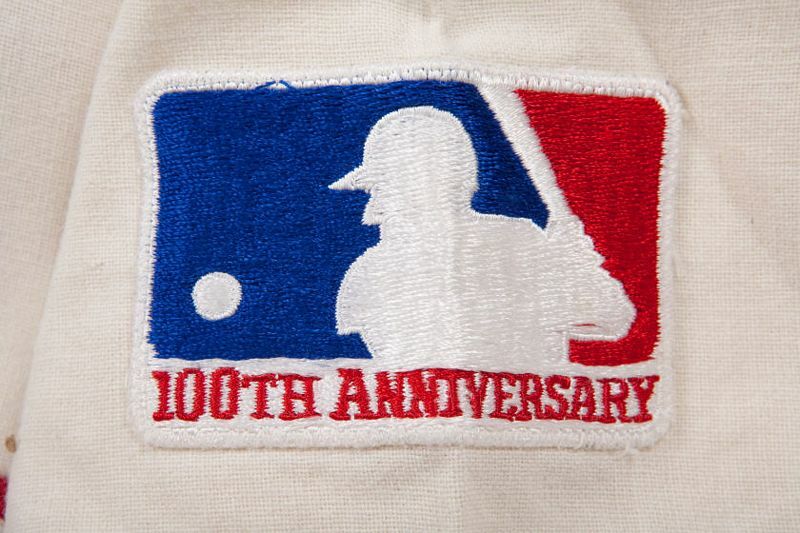 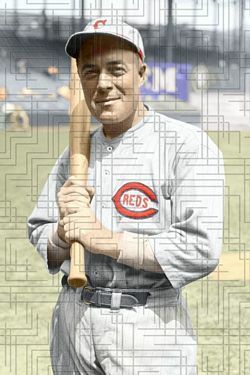 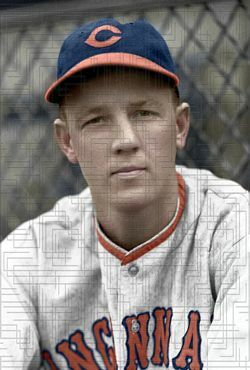 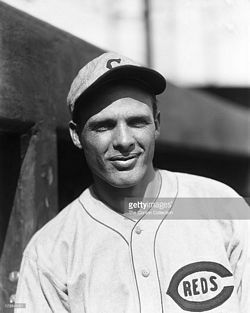 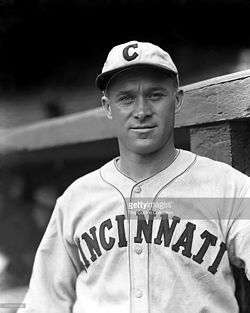 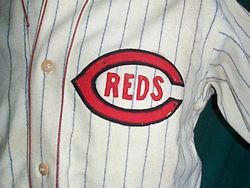 White trim was added to the logo during the season; perhaps it was done for the 1939 World Series jerseys. 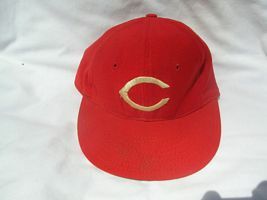 Seems this more rounded C" logo was used late 1938 or early 1939. 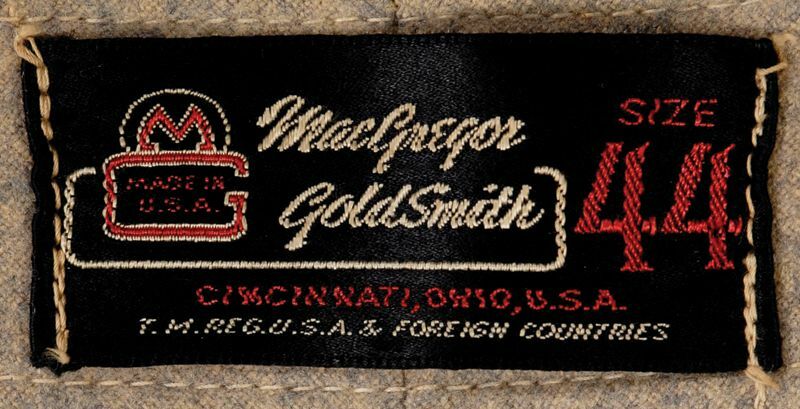 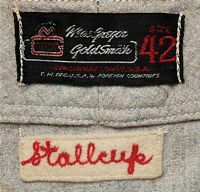 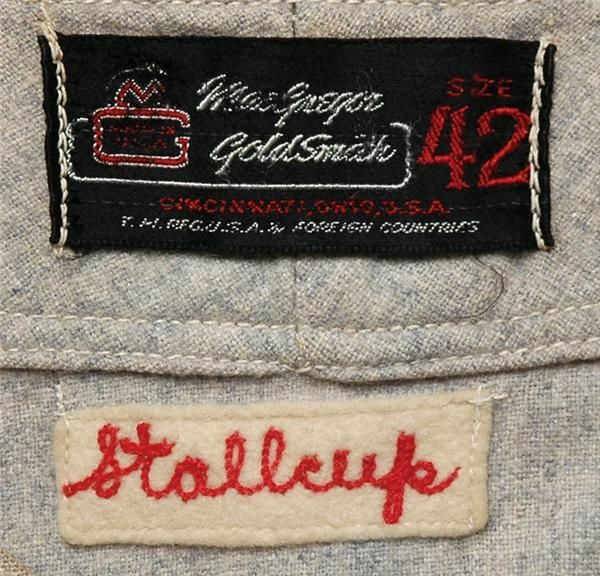 Goldsmith jerseys are made for the 1939 World Series. 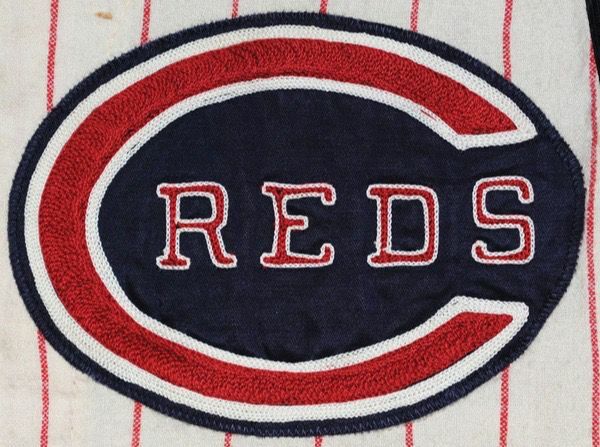 White trim is added to the home jersey logo. 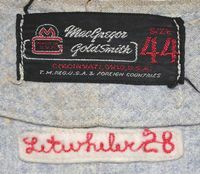 Photos clearly show Goldsmith number fonts, and road jerseys with the "I" on the left placket per the Goldsmith style. 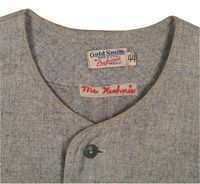 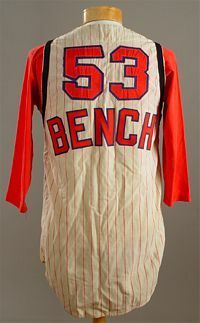 Both Goldsmith and Spalding jerseys are used in 1940. 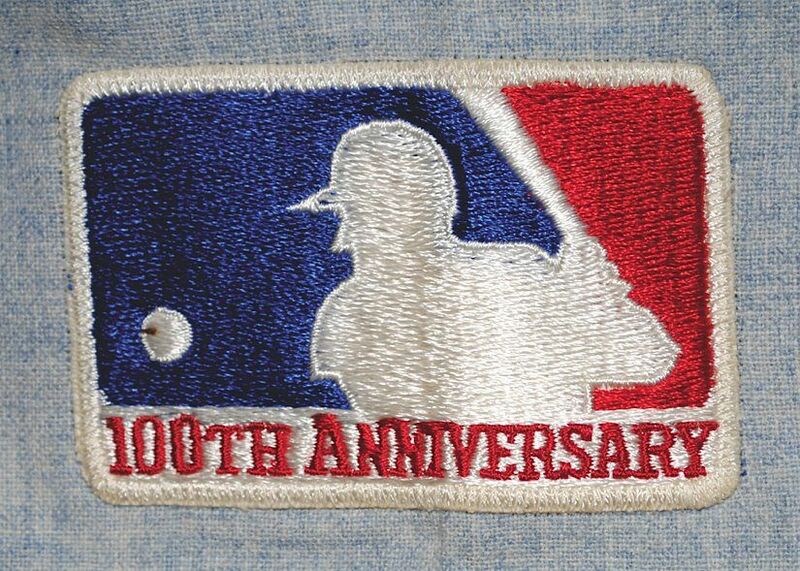 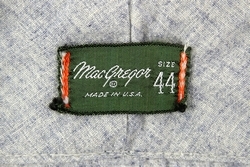 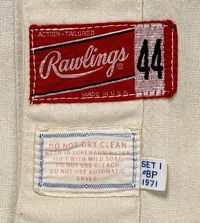 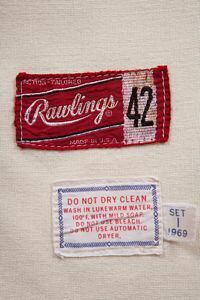 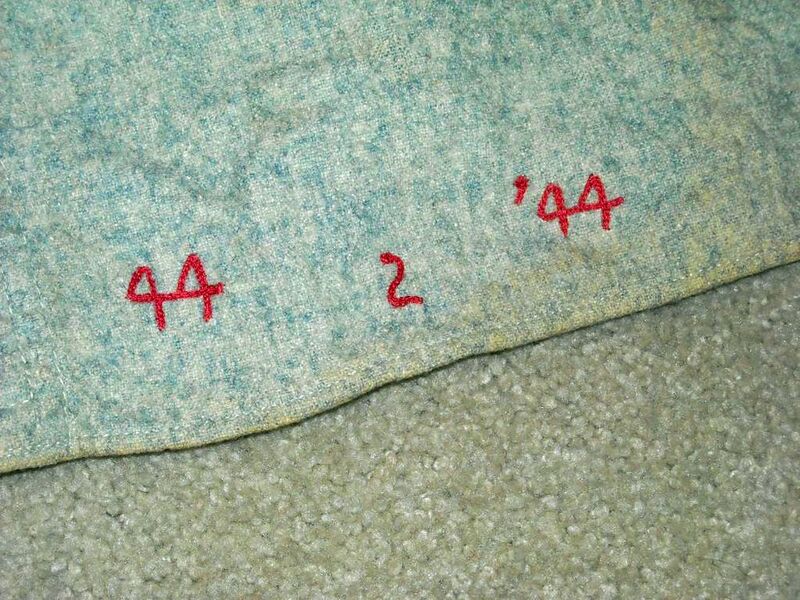 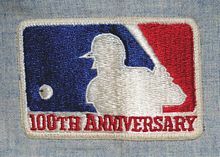 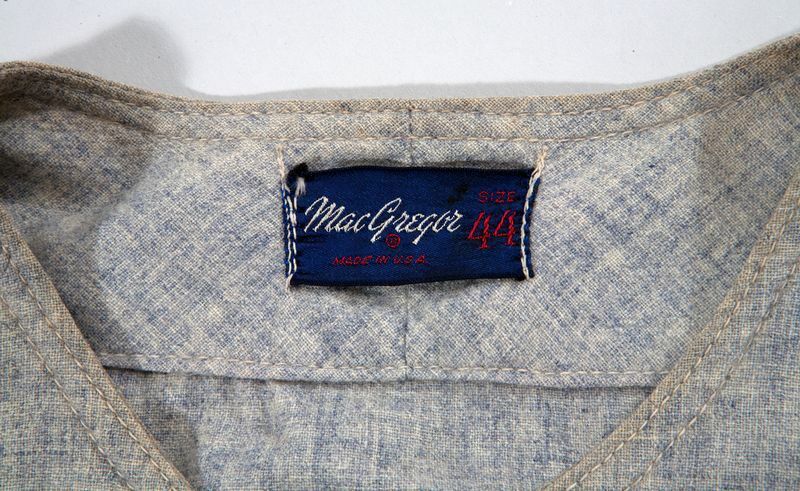 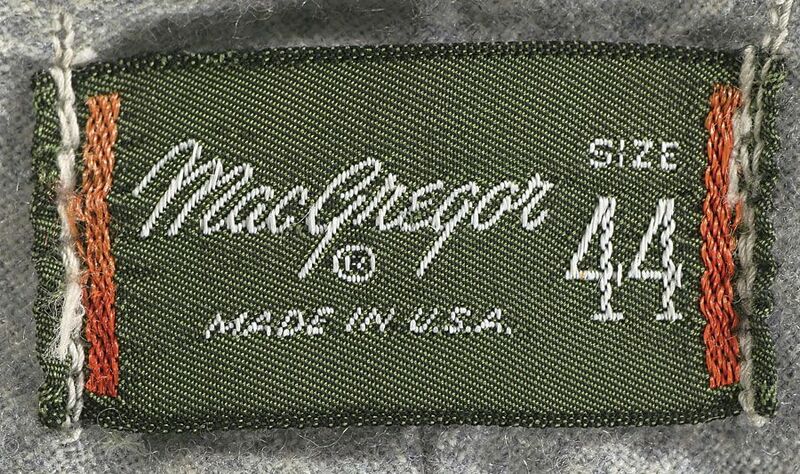 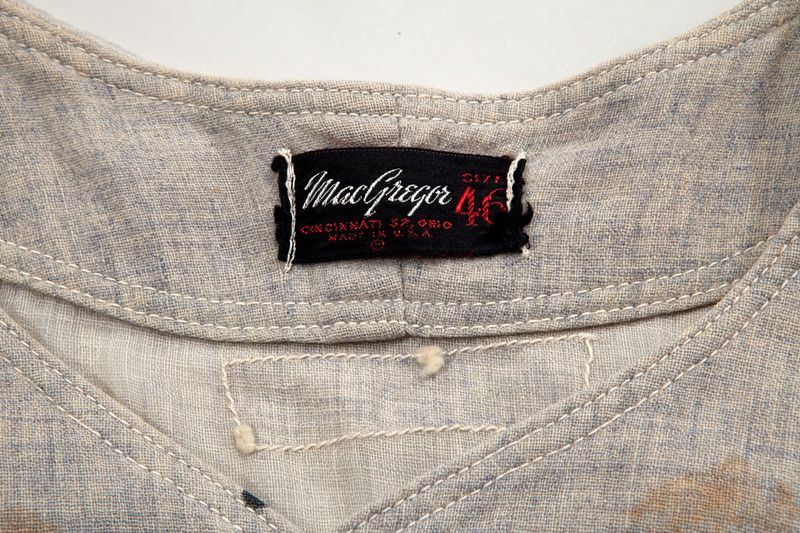 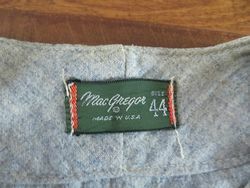 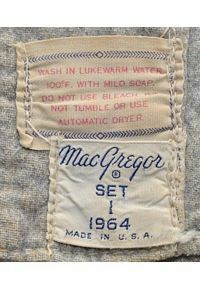 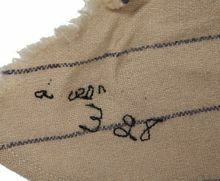 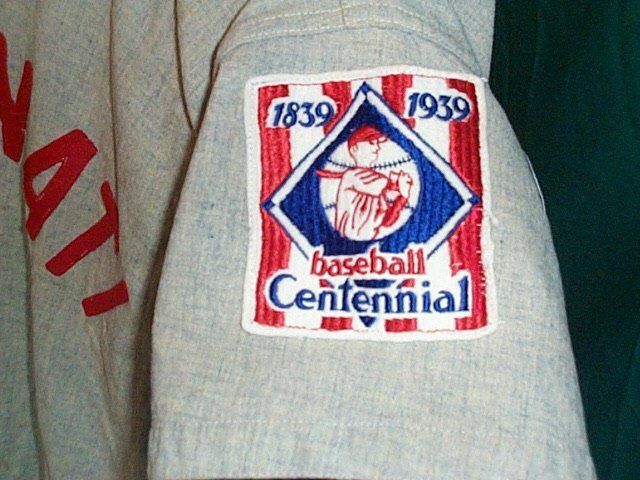 The 1939 sleeve patches removed probably for reuse in 1940. 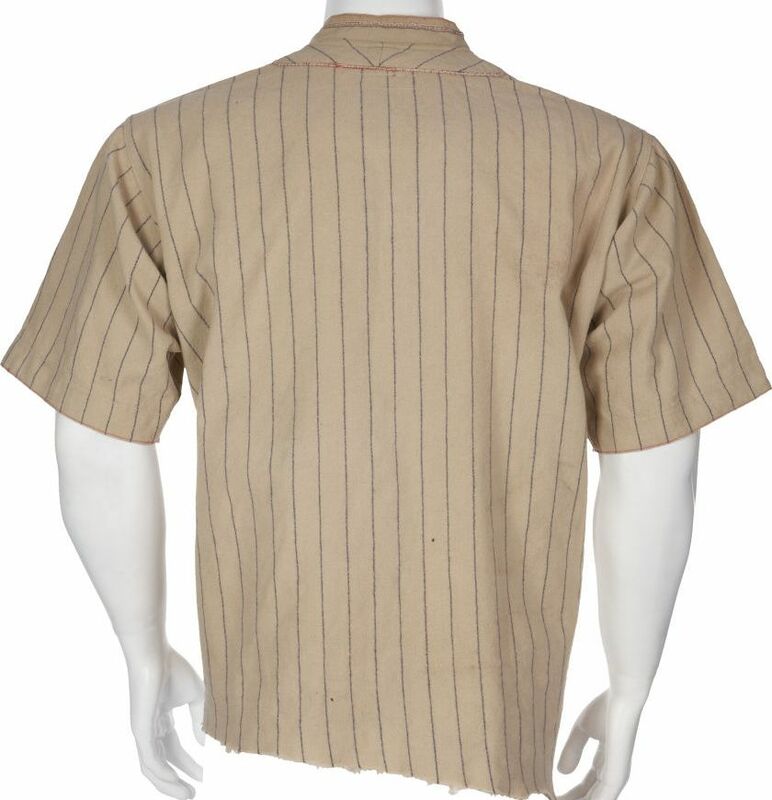 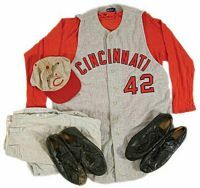 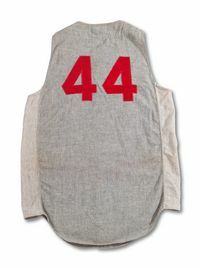 Spalding jerseys are also used during the 1940 season and 1940 World Series. 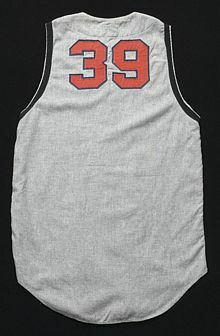 Photos show Spalding number fonts and road jerseys with the "N" on the left placket (whereas Goldsmith jerseys put the "I" on the left placket). 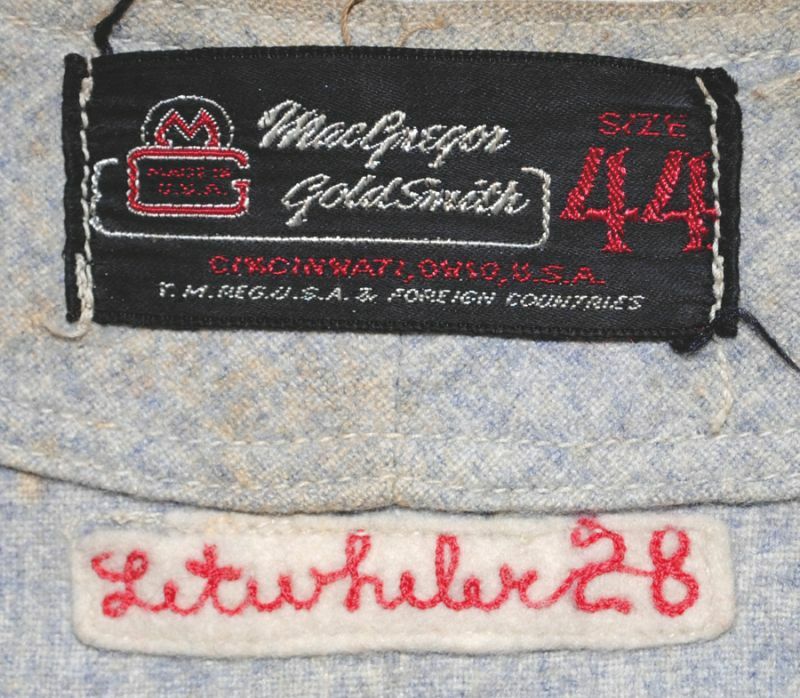 Looks like Goldsmith jerseys used in this timeframe. 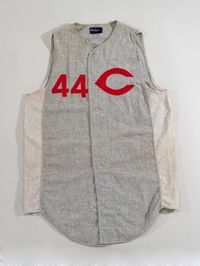 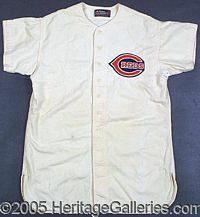 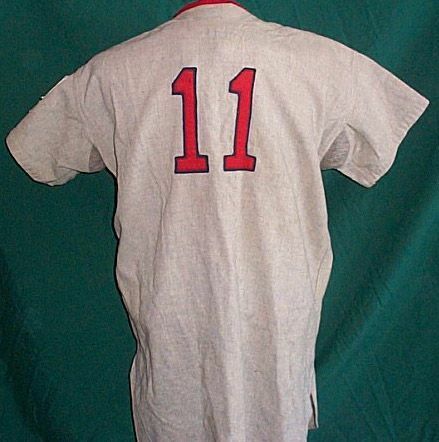 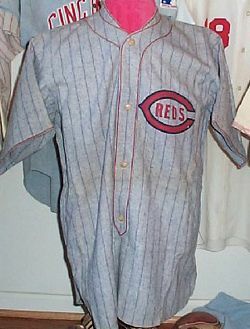 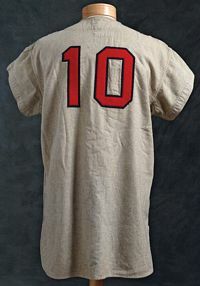 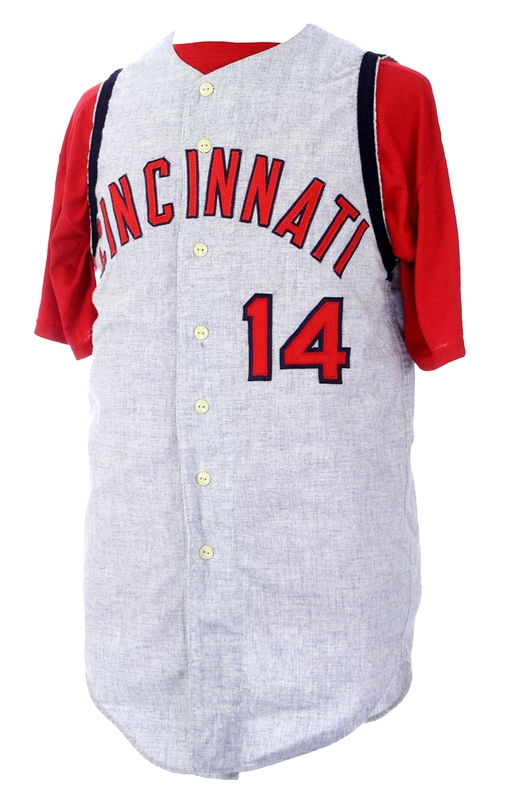 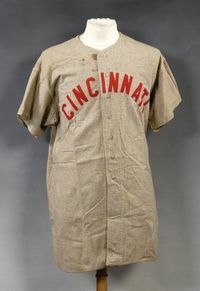 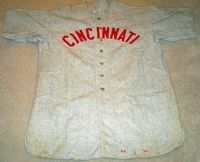 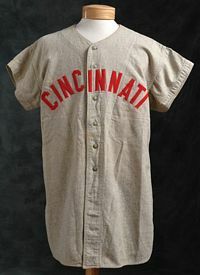 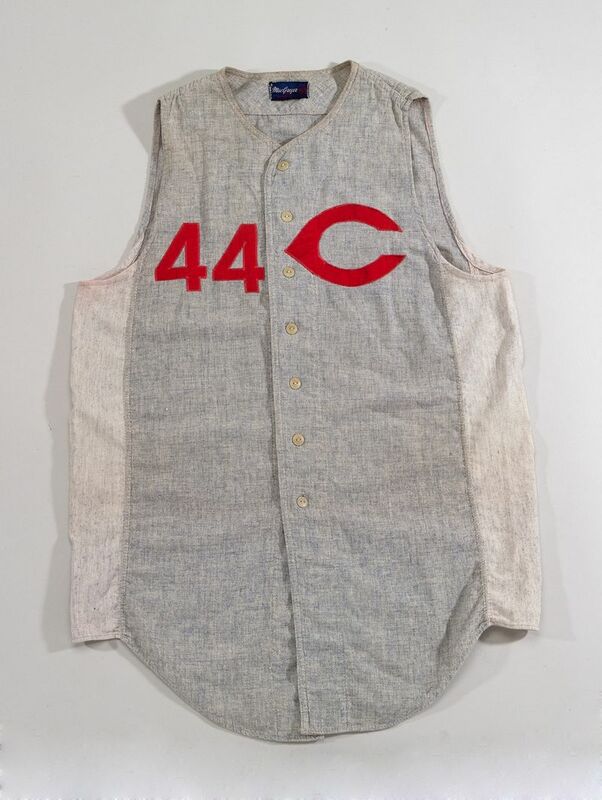 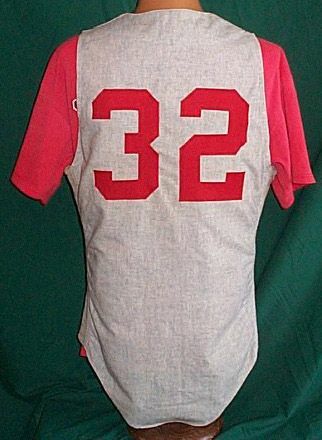 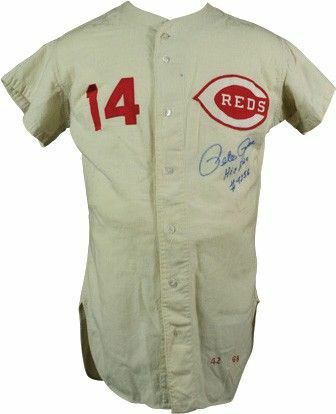 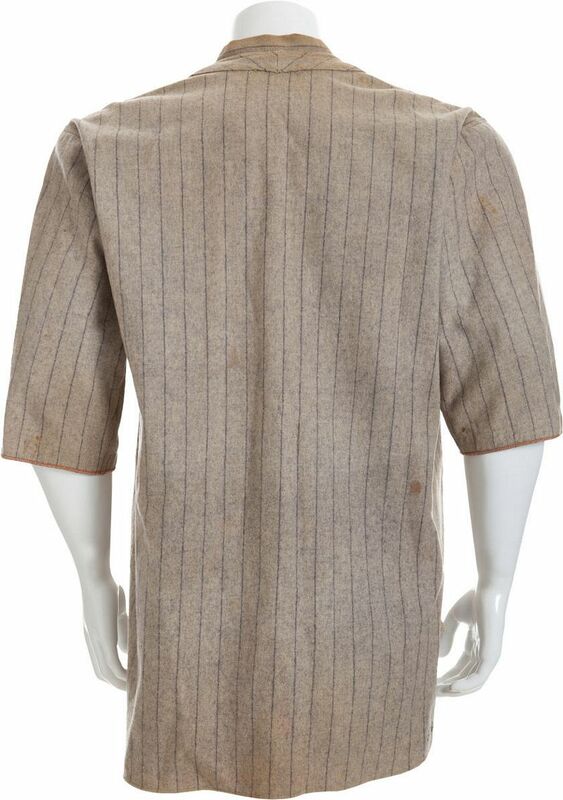 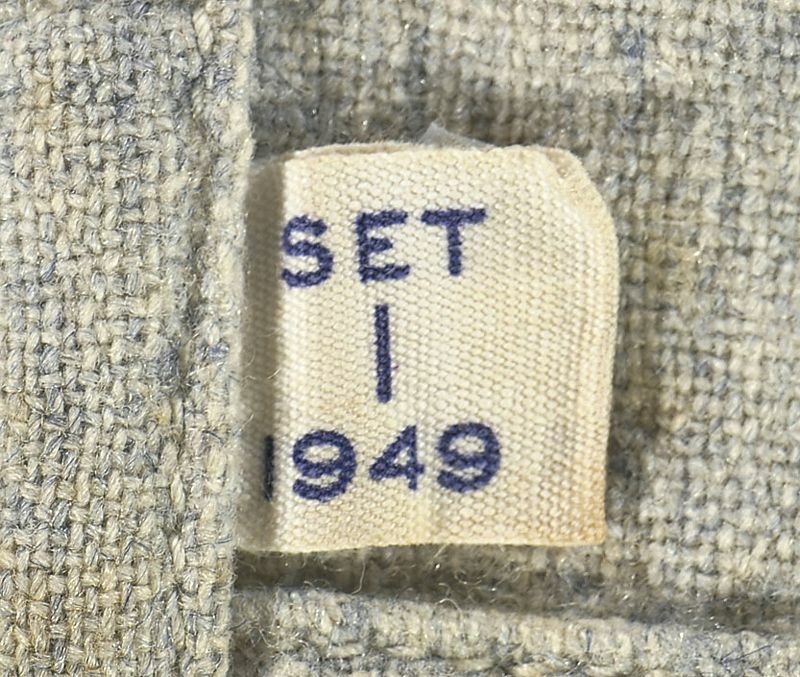 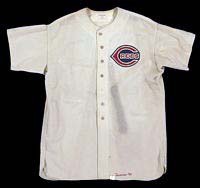 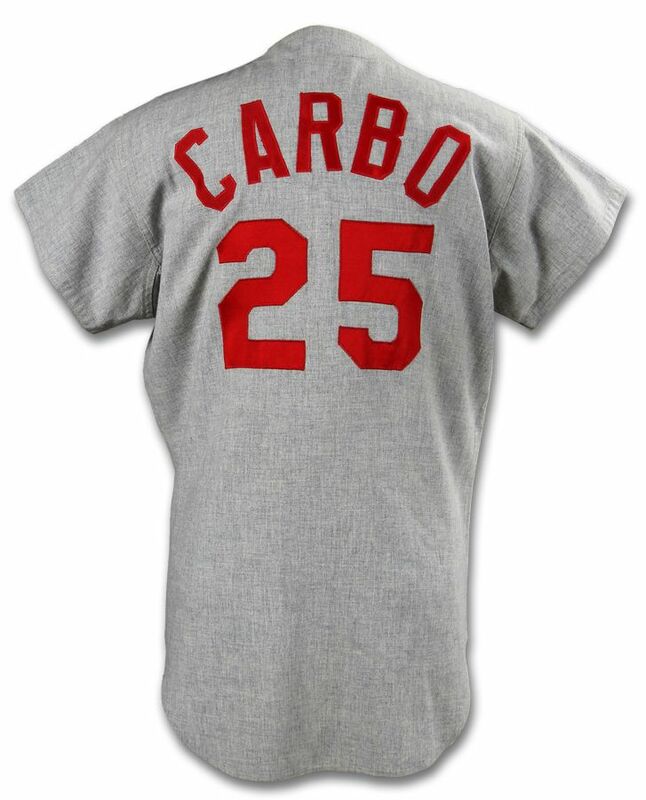 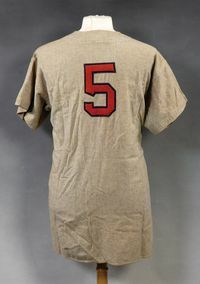 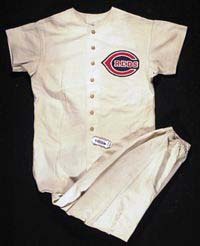 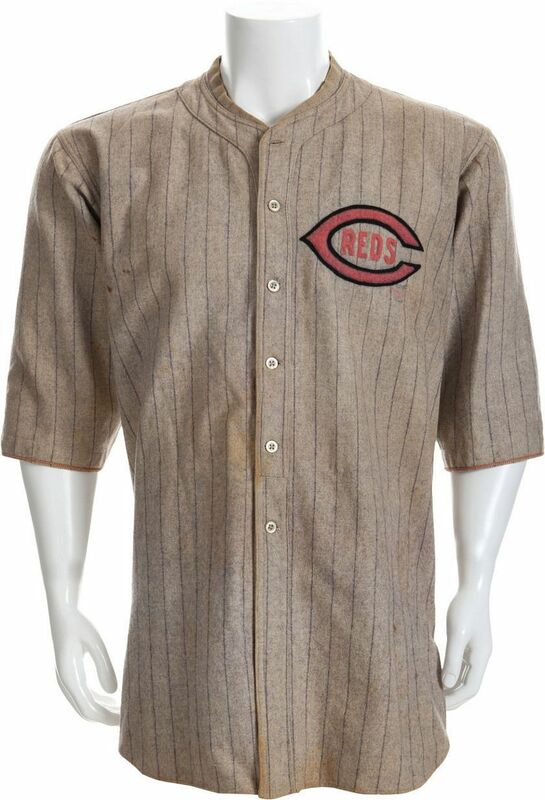 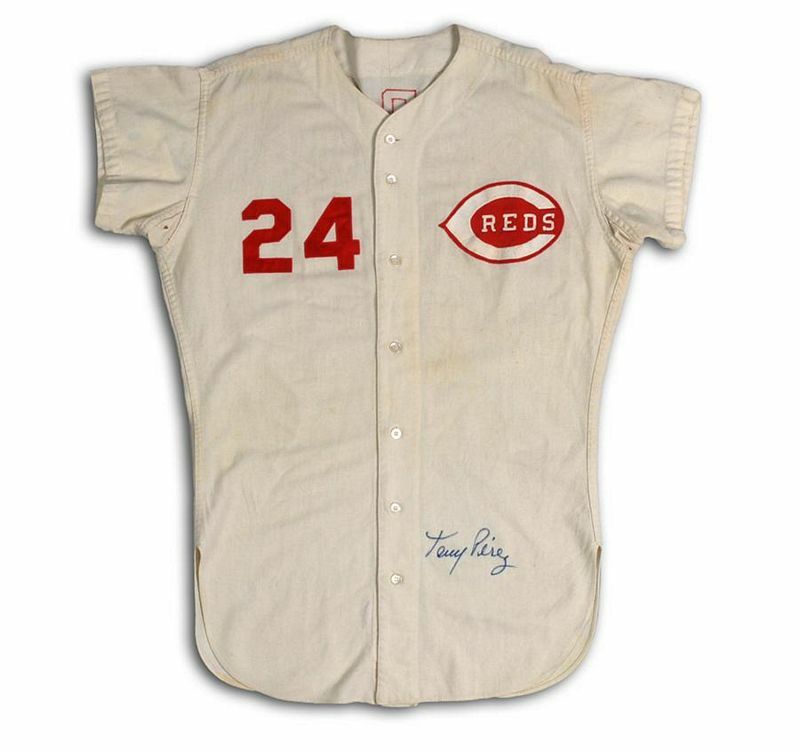 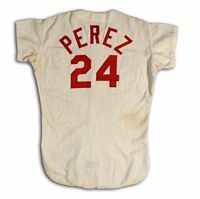 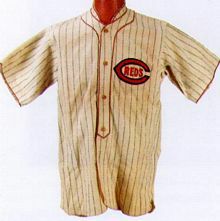 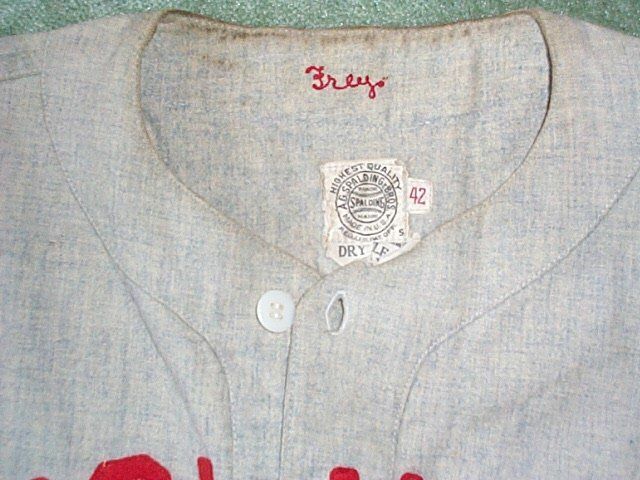 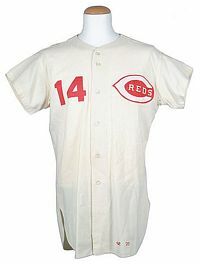 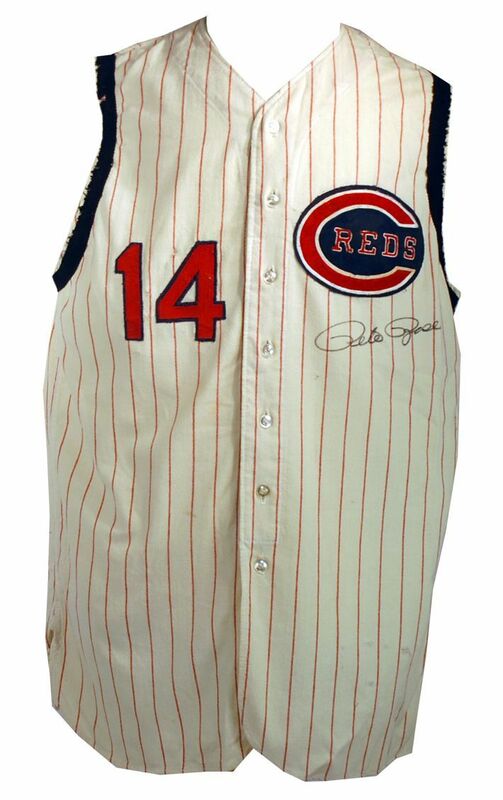 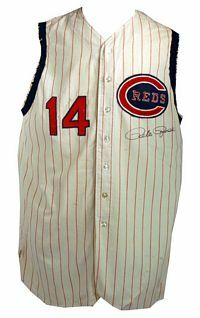 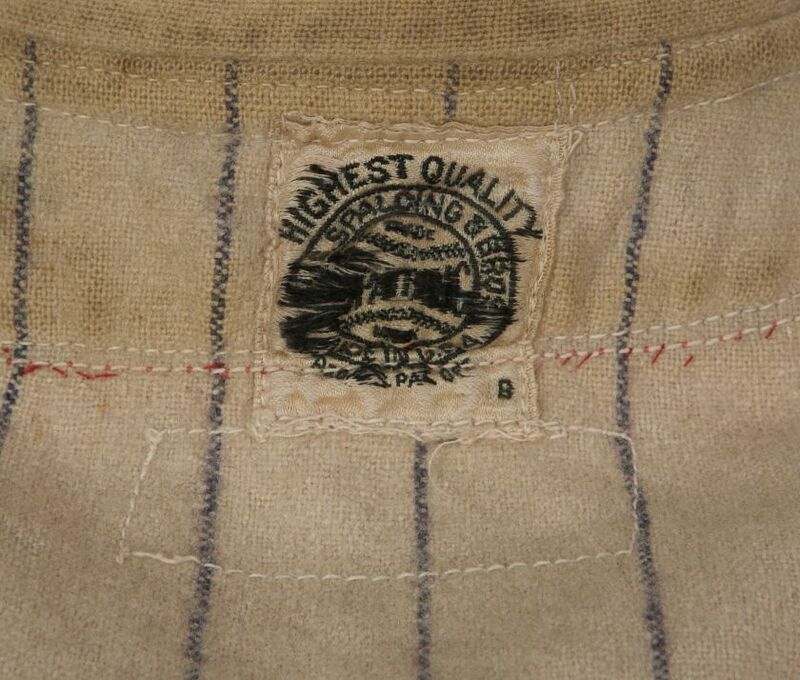 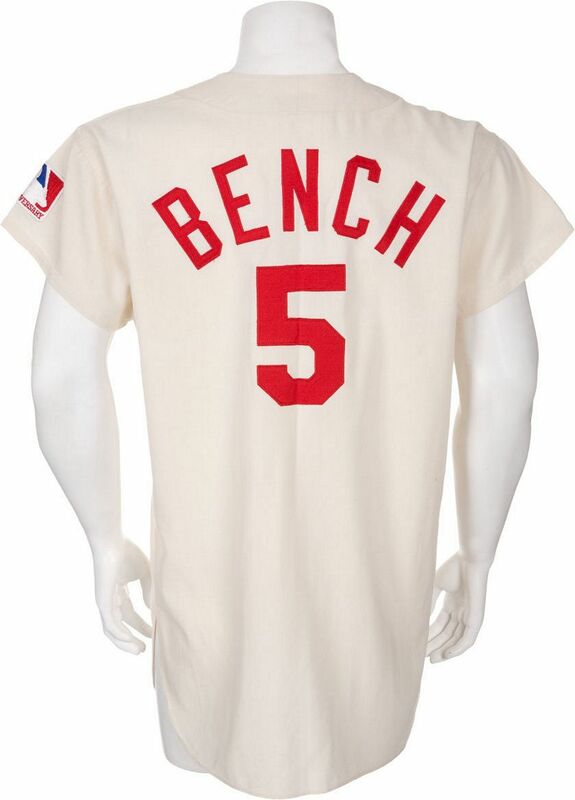 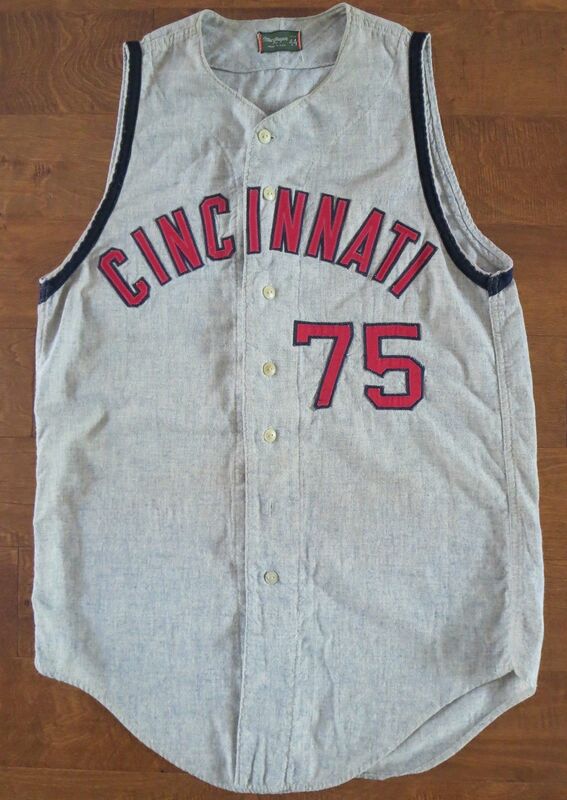 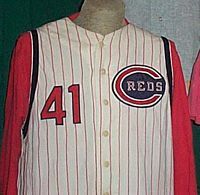 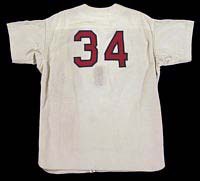 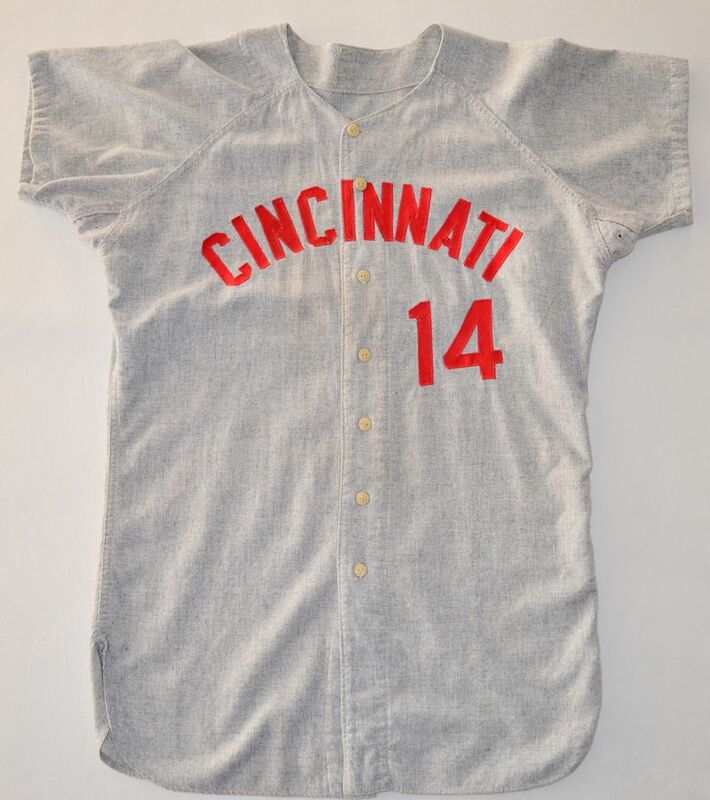 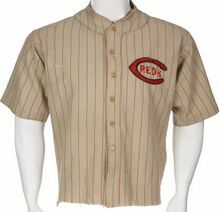 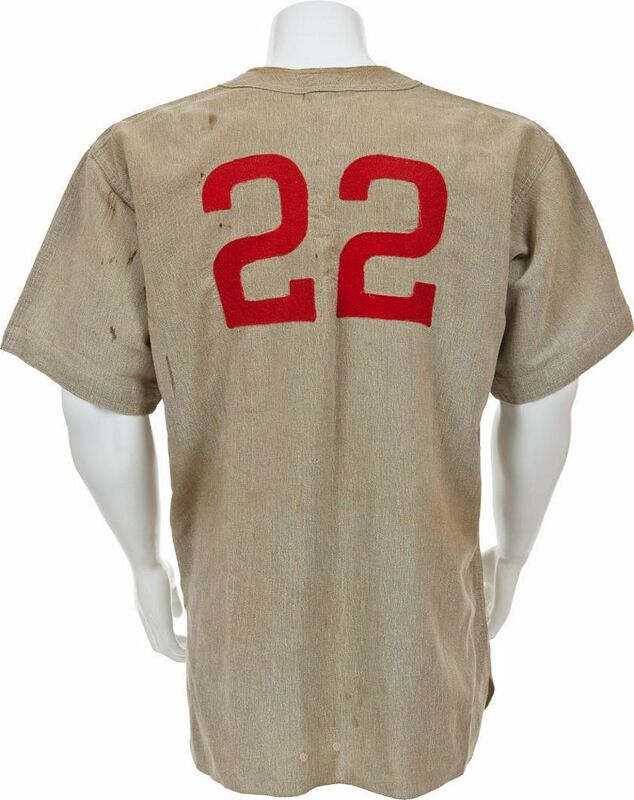 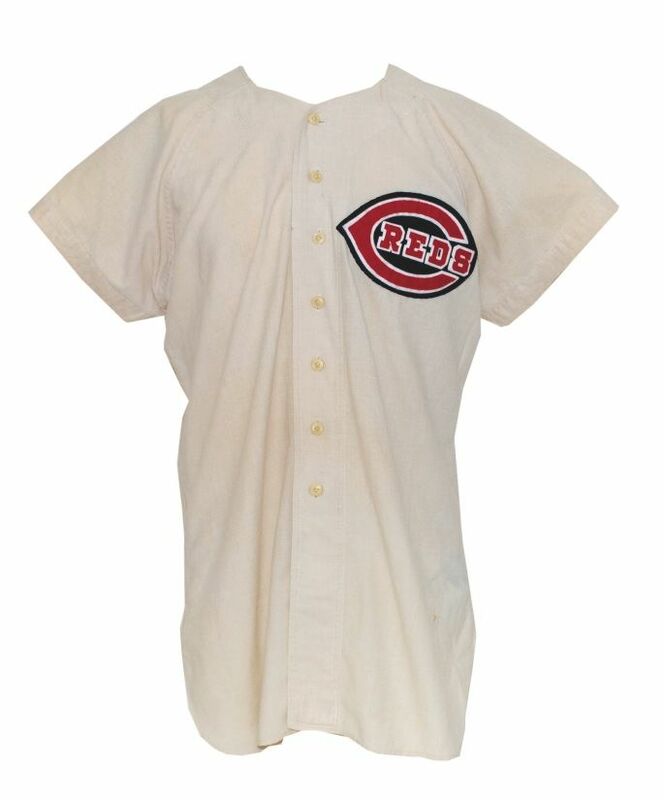 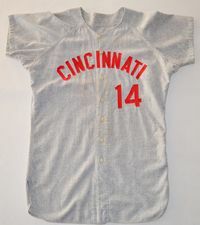 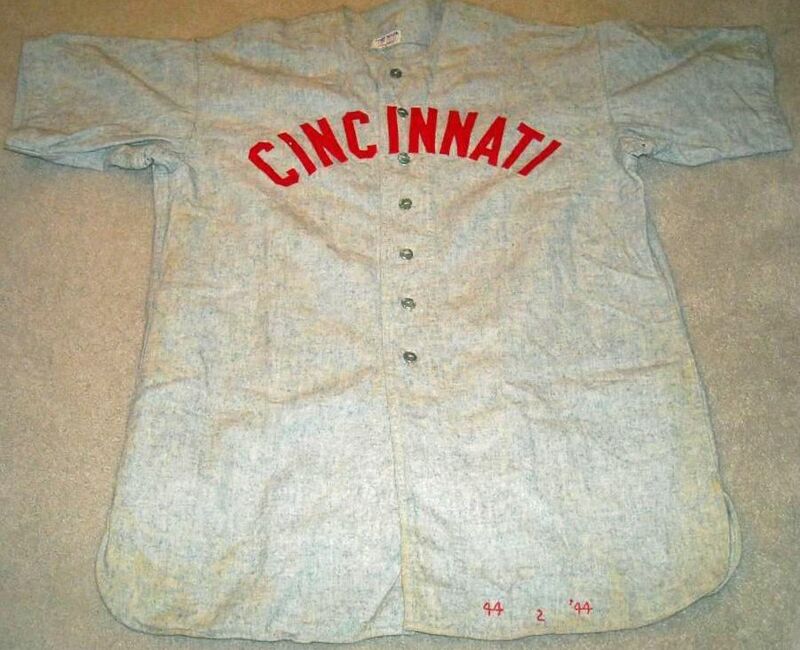 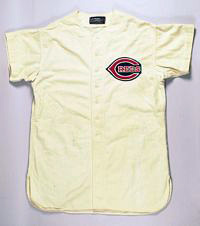 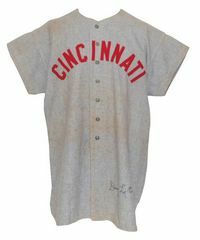 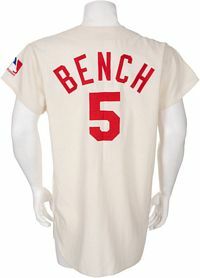 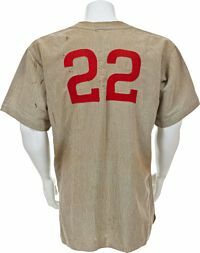 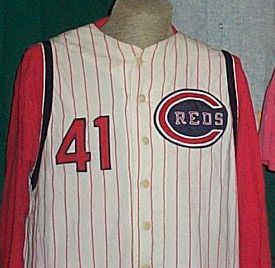 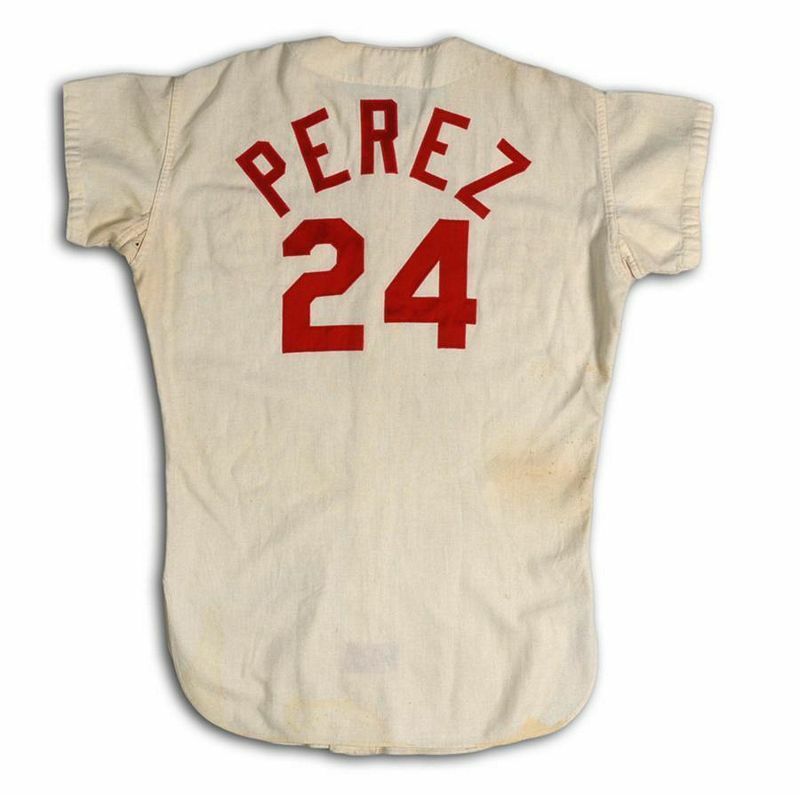 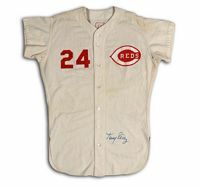 This 1941 jersey had the "HEALTH" patch added when reused in 1942. Navy undershirts and stockings give way to red. 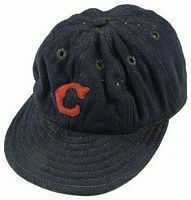 Cap now solid navy. 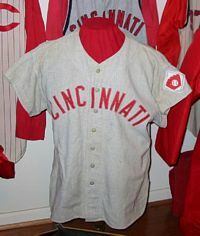 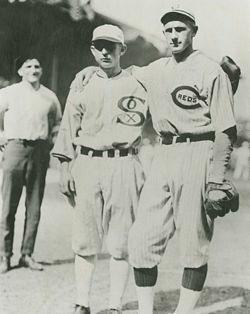 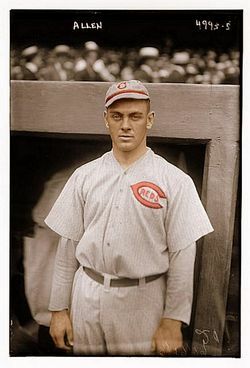 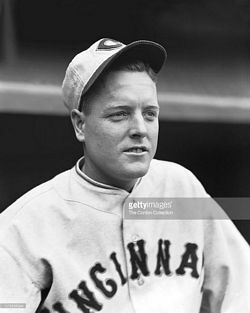 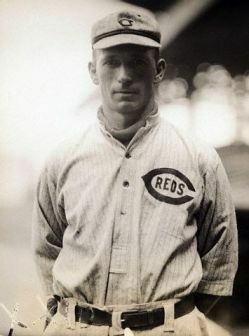 The Reds wear satin jerseys (and caps!) 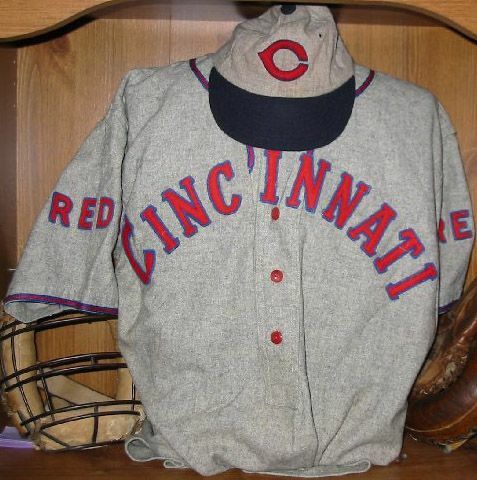 both home and road for some games in 1947-48. The Reds become Red Stockings in 1953. 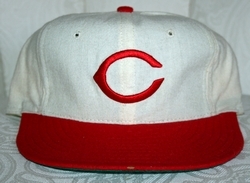 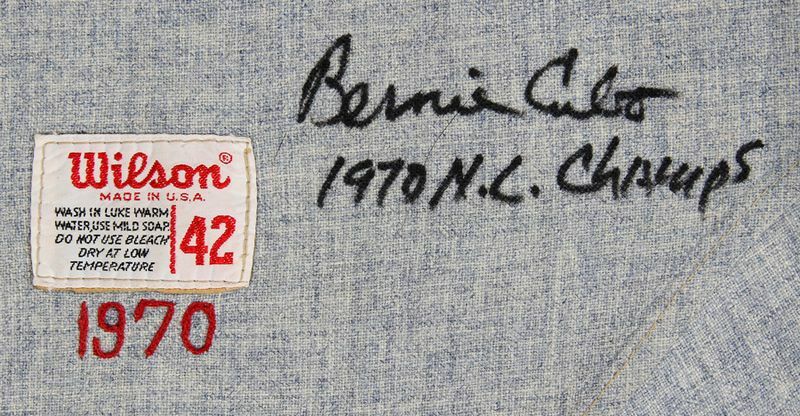 White outline was added on cap logo in 1954 (not 1955). 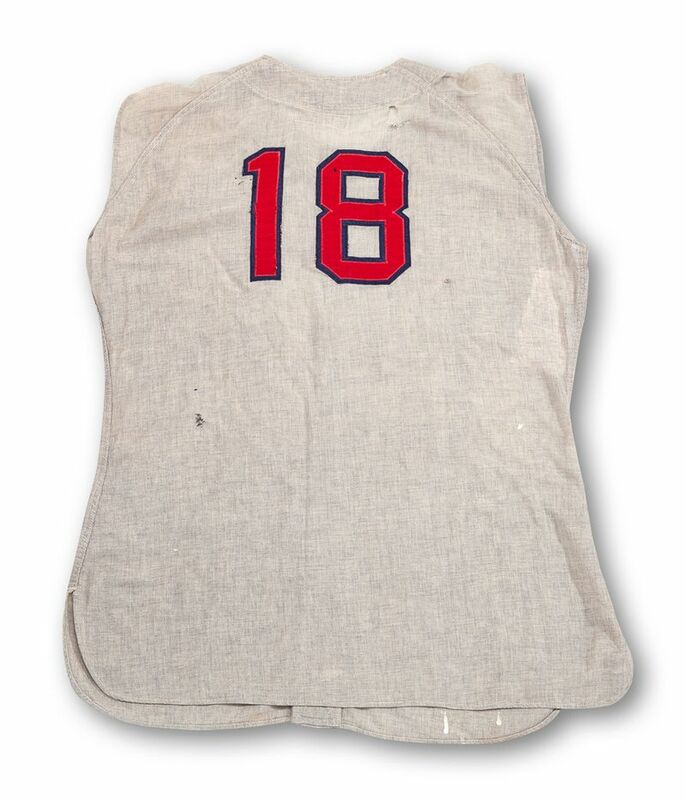 Ted Kluszewski #18 always cut the sleeves off his jerseys. 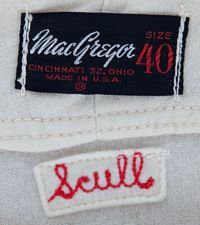 Another name change. 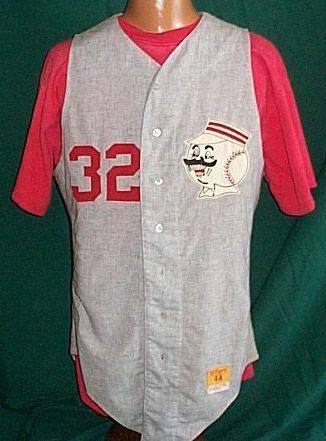 Mr. Red patch added on left sleeve. It has a square background to start the season but by mid year it's just the shape of the image. Looks like Ted wore this over his "good" clothes to paint his house. 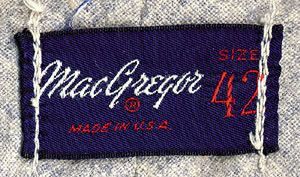 Navy dropped as an accent color. 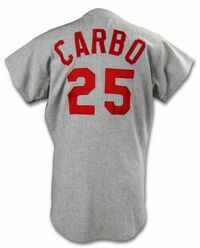 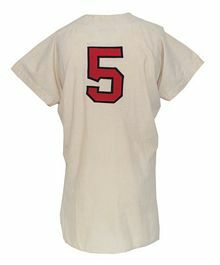 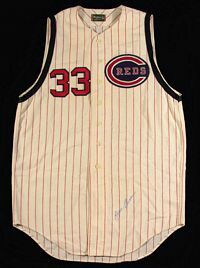 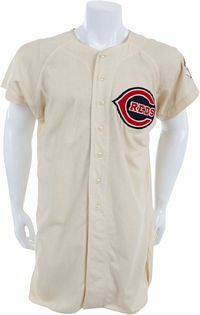 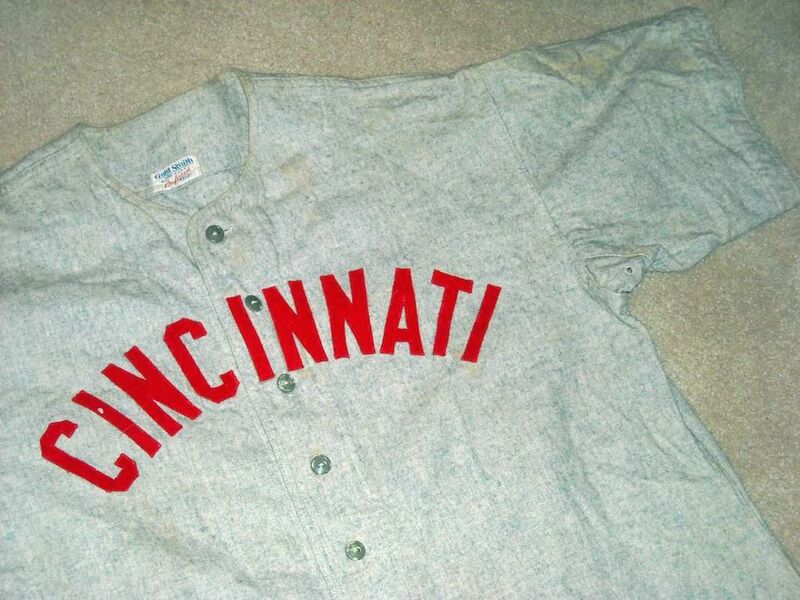 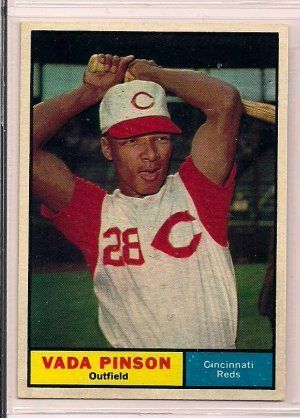 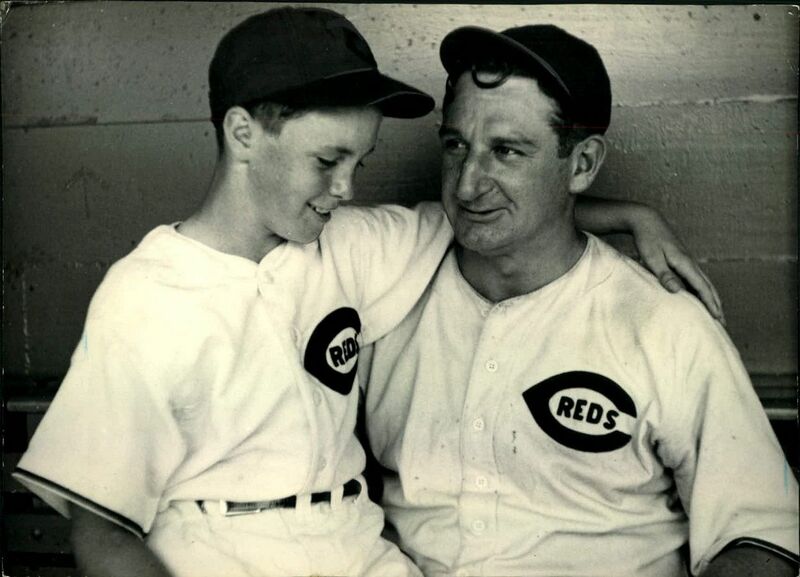 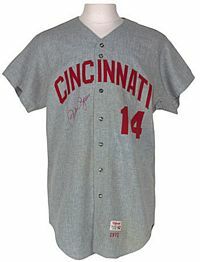 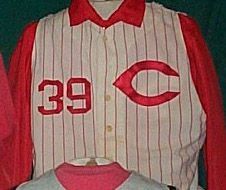 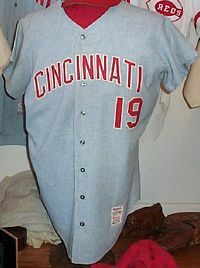 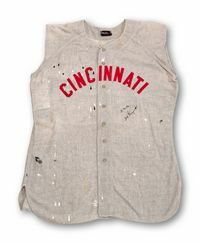 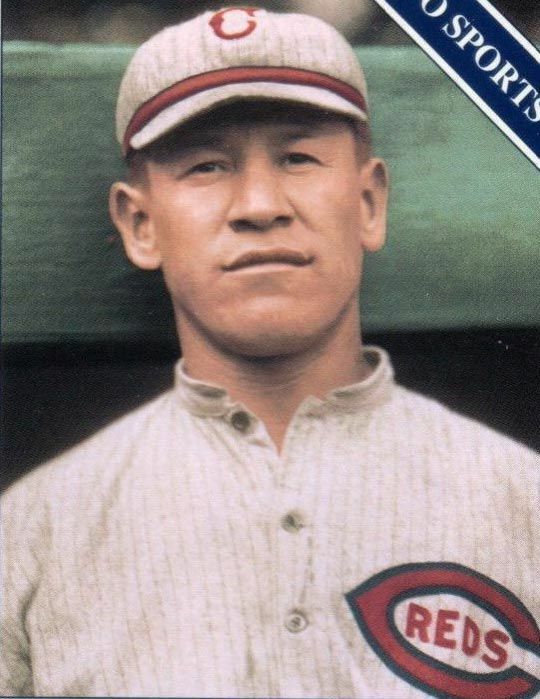 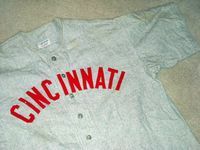 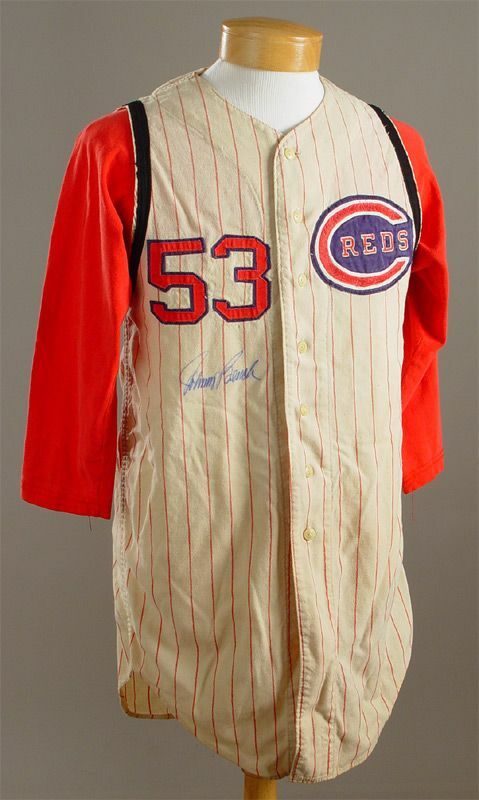 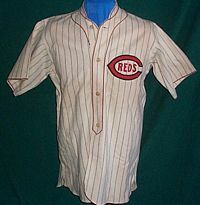 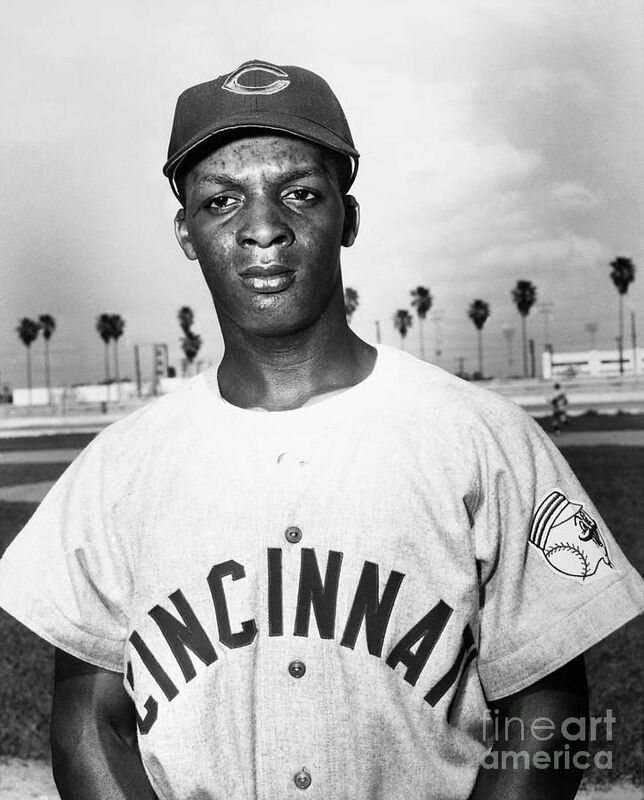 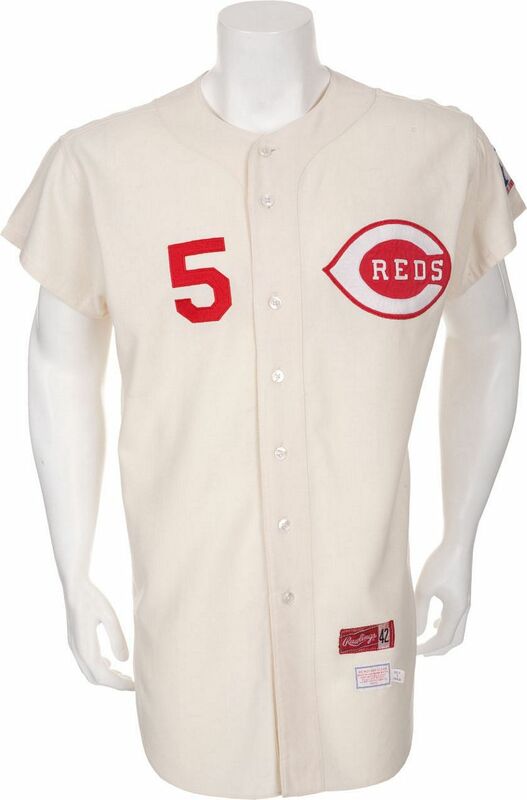 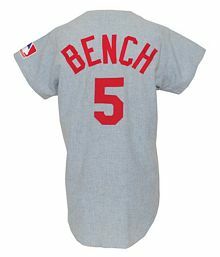 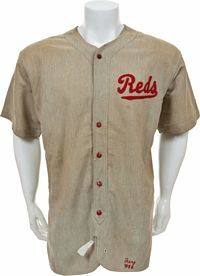 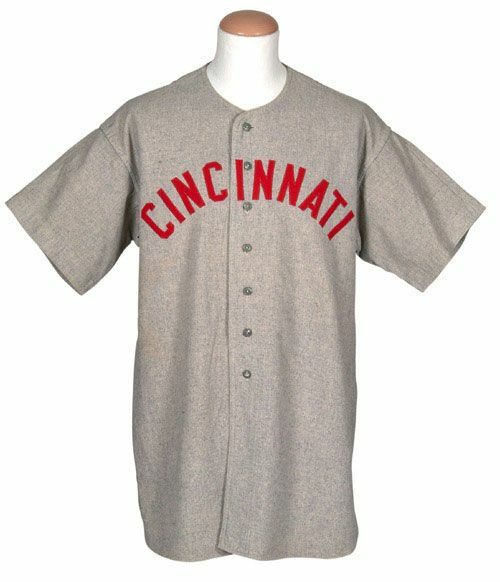 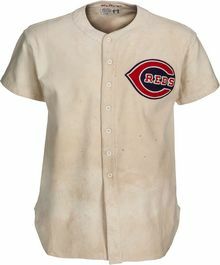 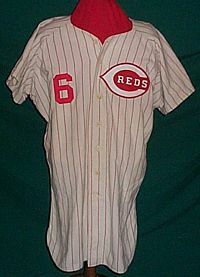 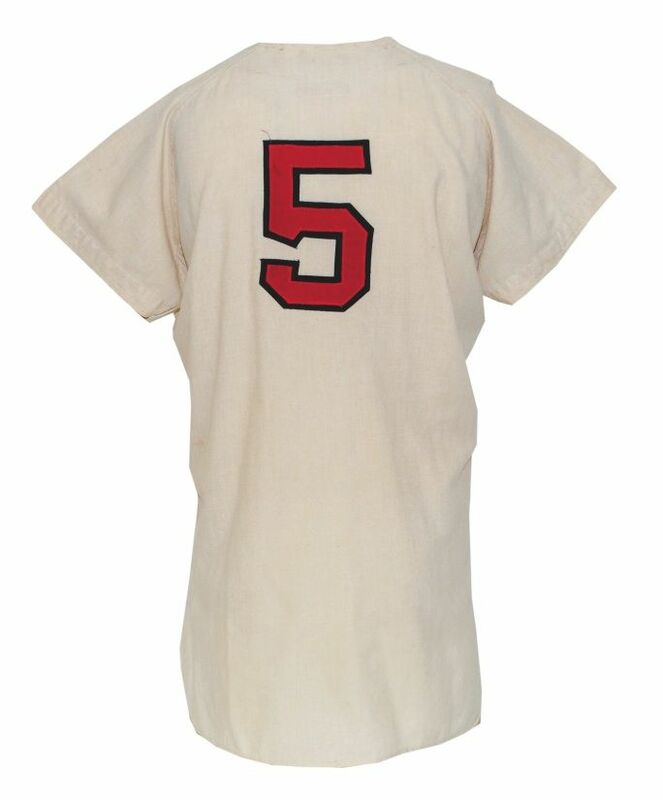 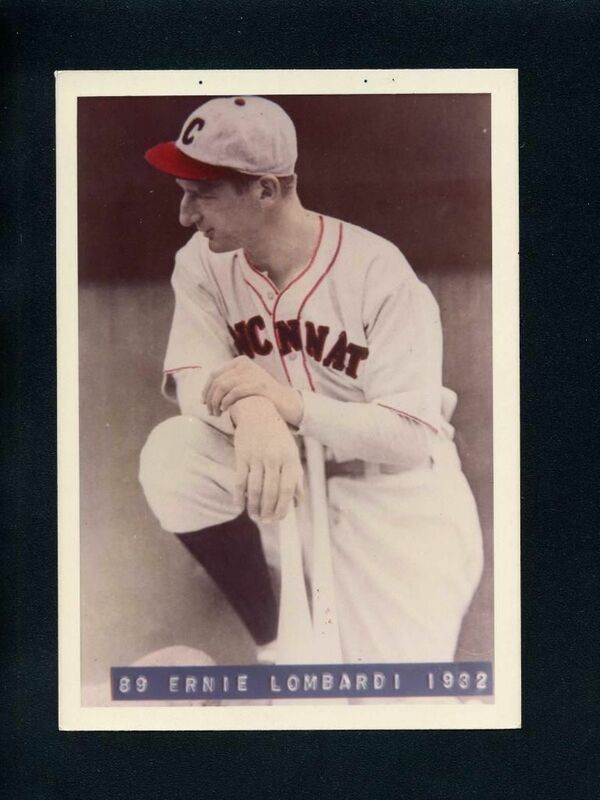 There was no mention of "Reds" or "Redlegs" on jerseys from 1956-60. White vest with wishbone C worn at home. 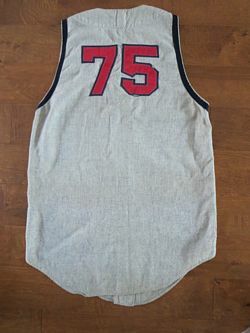 Jerseys are elastic knit nylon and durene. 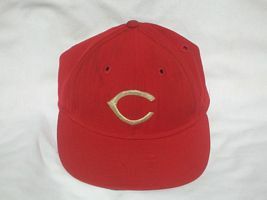 Cap changed to red. Wishbone "C" logo - without the "Reds" - on left side of both jerseys. 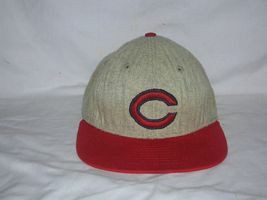 White cap at home, grey on road. 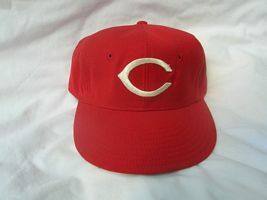 Back to Reds. 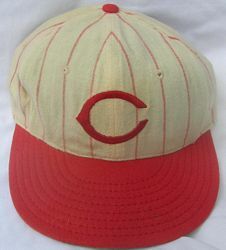 Pinstripes also added to home cap. 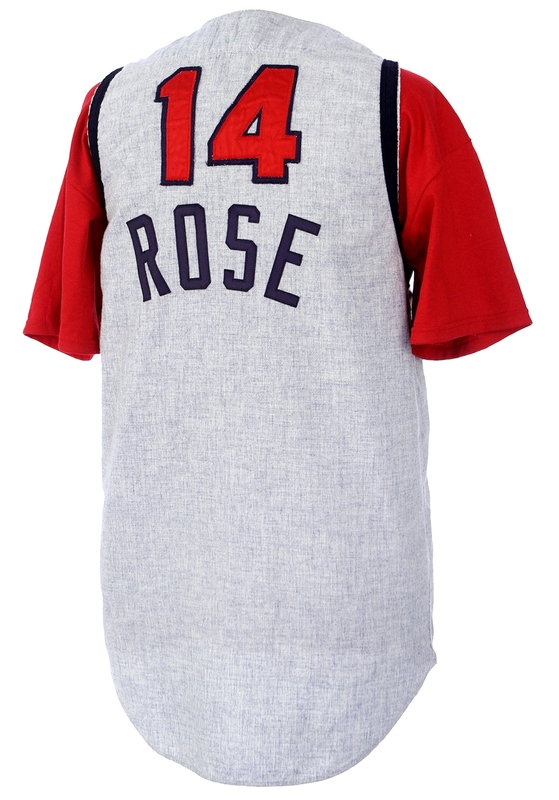 Navy trim returns. 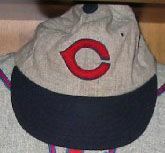 The "C" changes from wishbone to rounded. 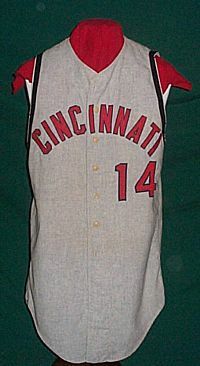 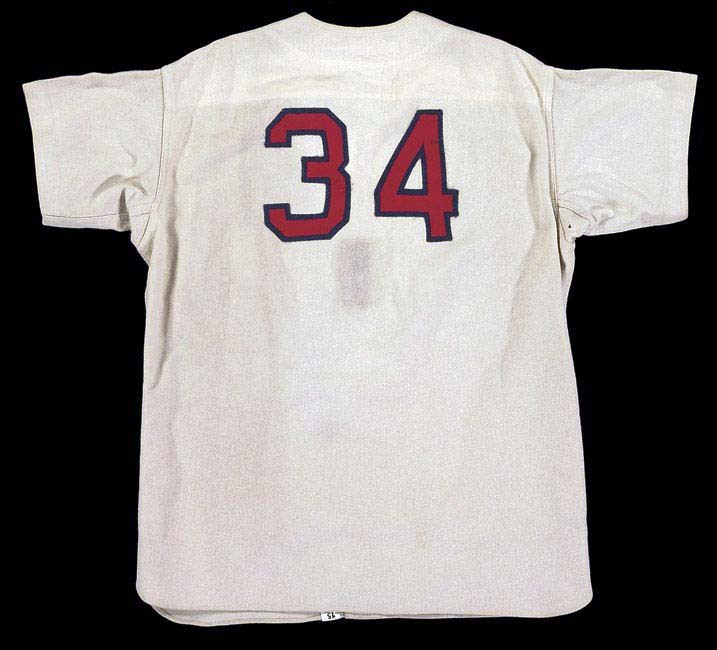 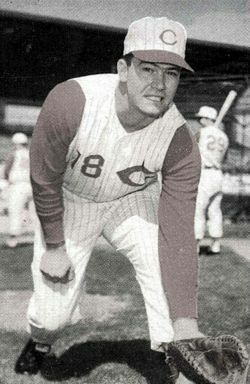 Navy armbands on the left shoulder worn during 1961 for Powell Crosley (has been removed here). 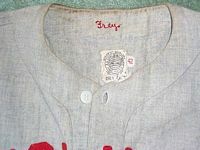 The cap in the jersey photo is not an on-field cap. 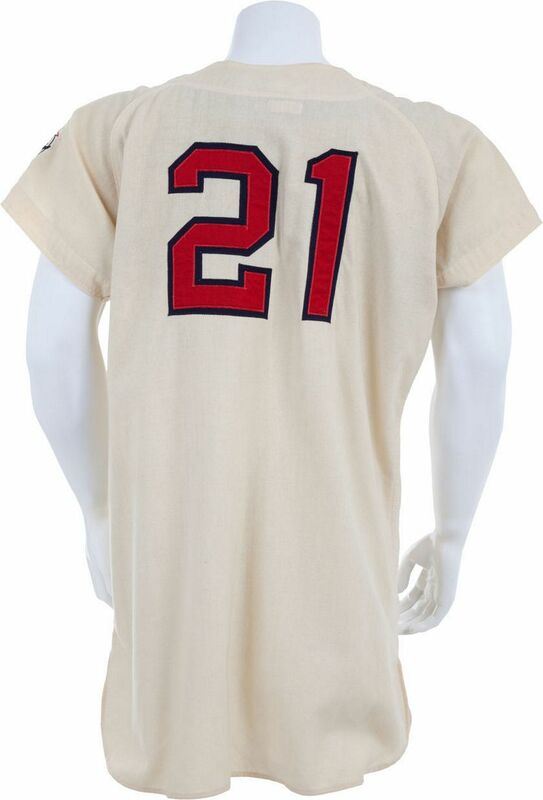 The navy armband now adorns both shoulders. 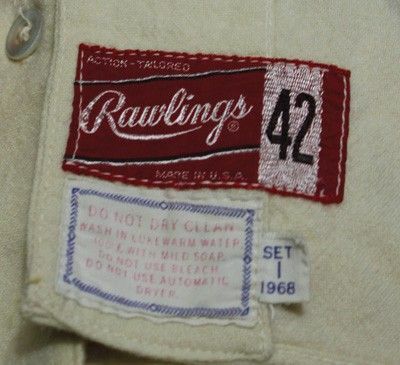 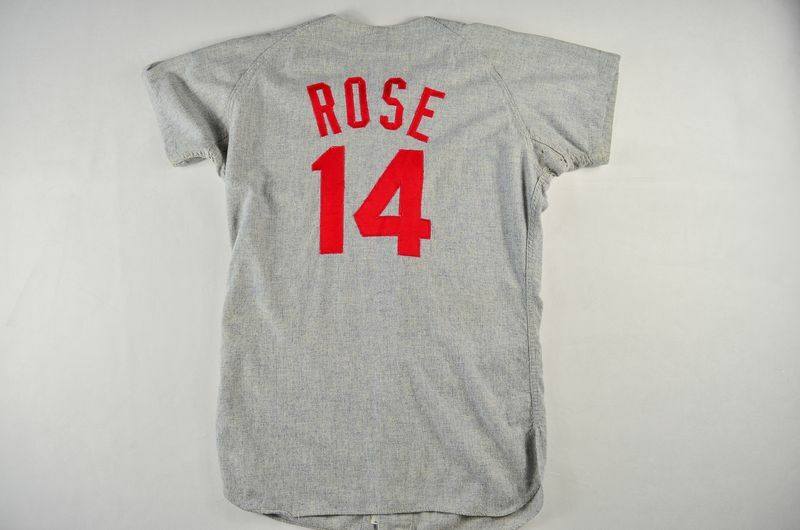 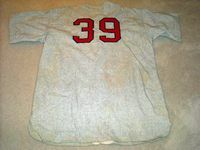 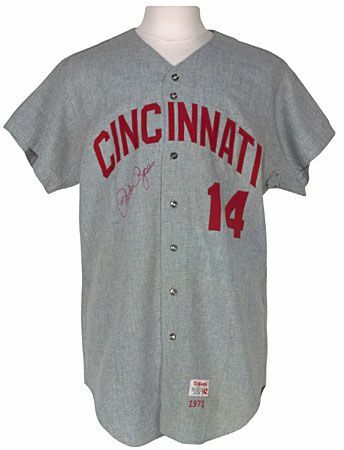 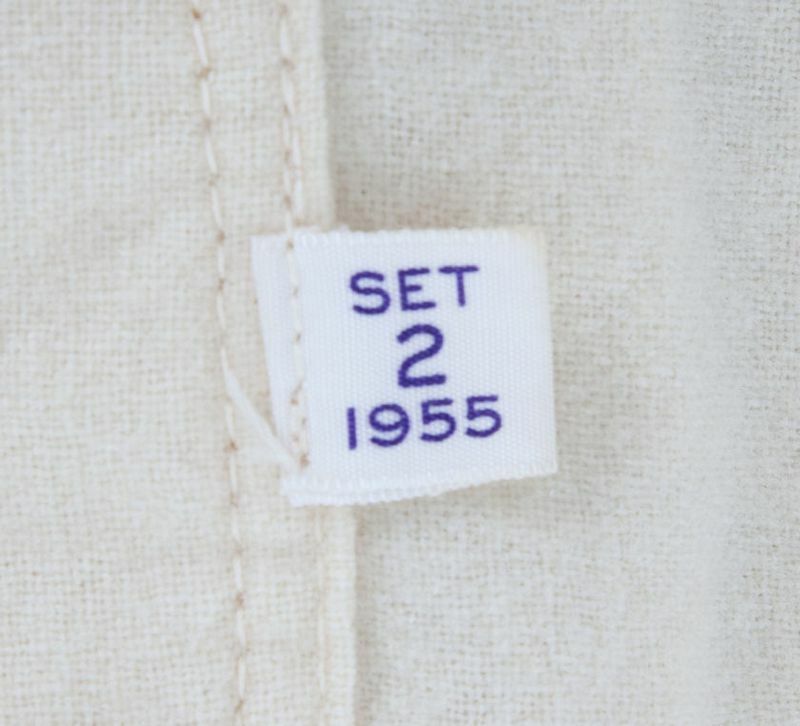 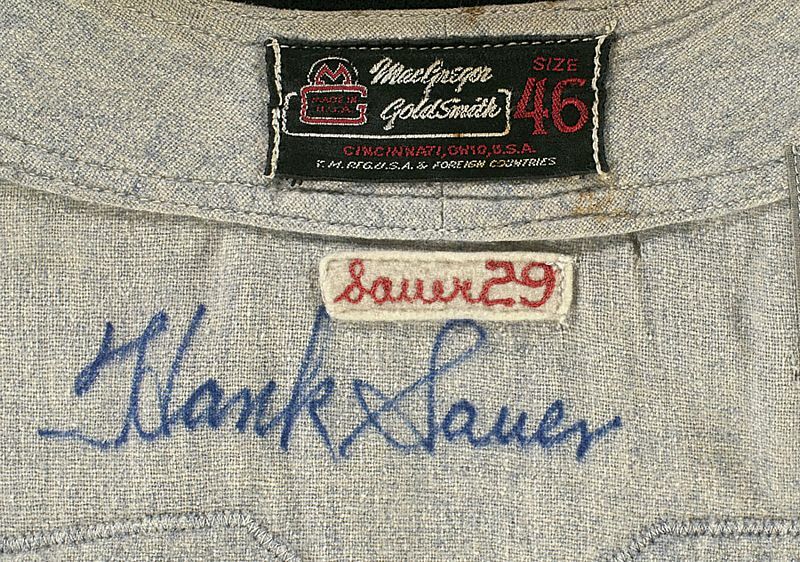 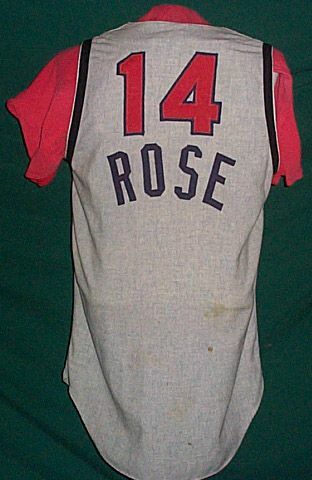 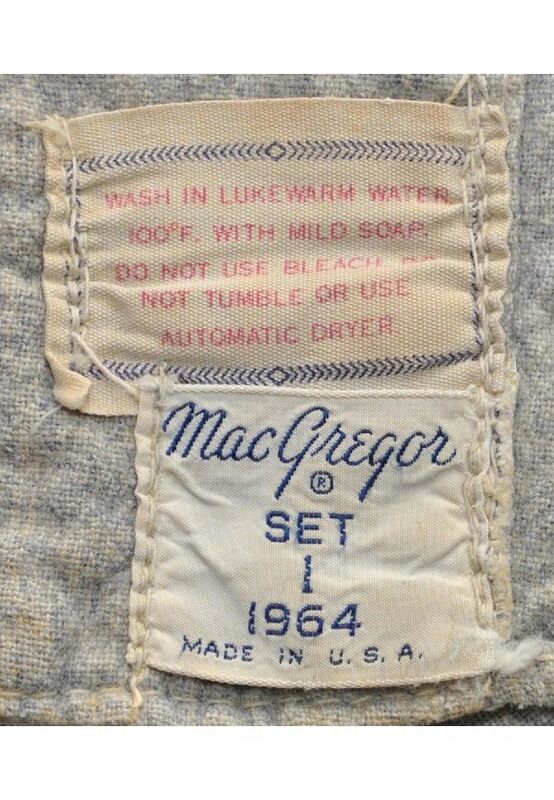 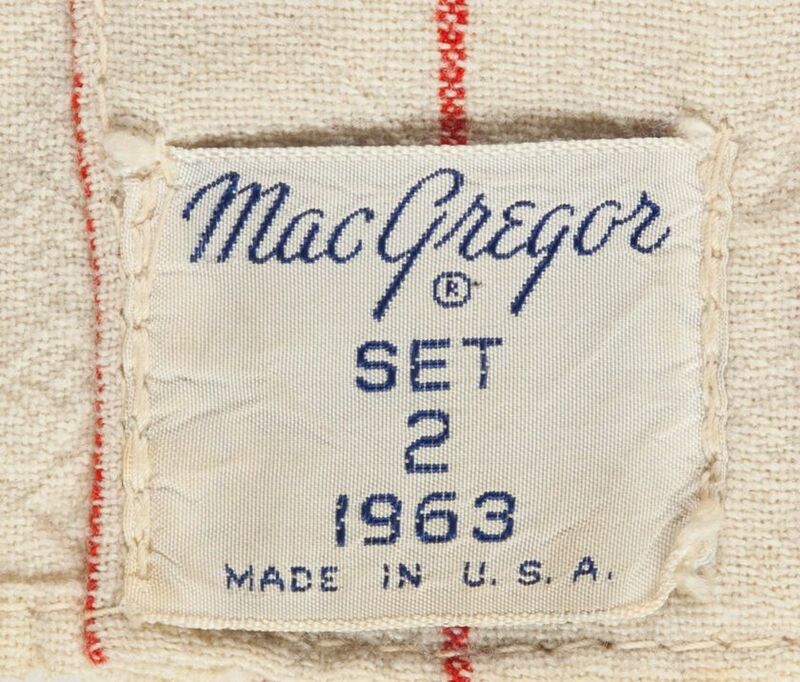 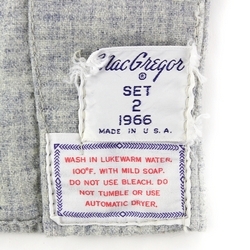 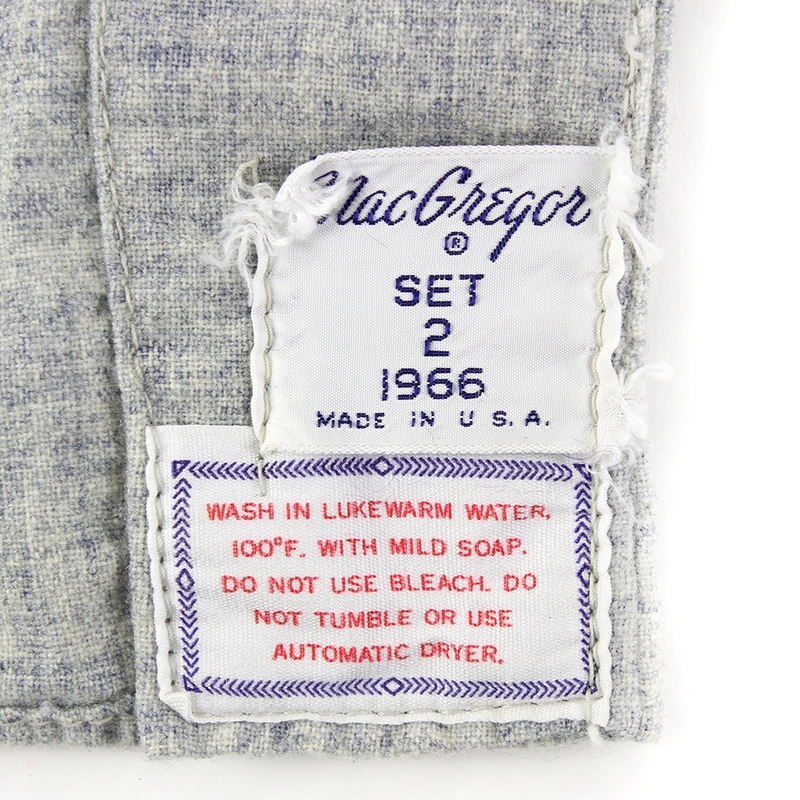 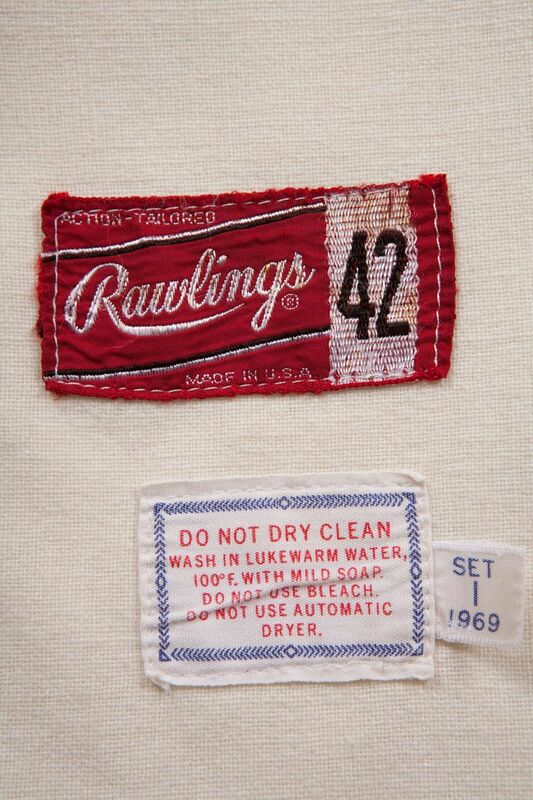 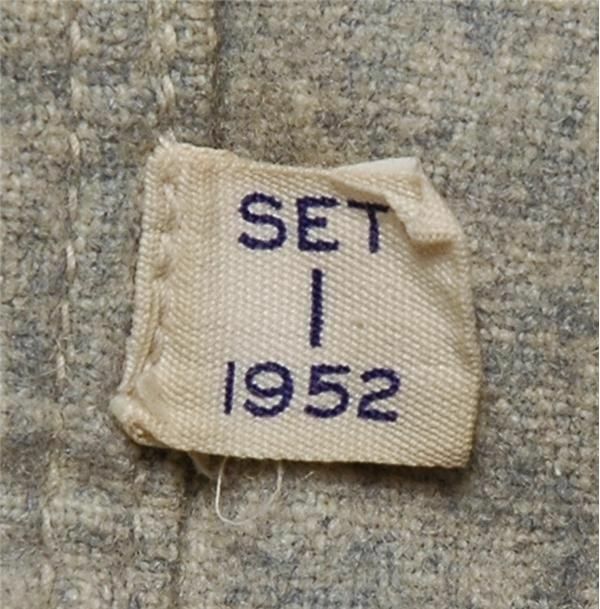 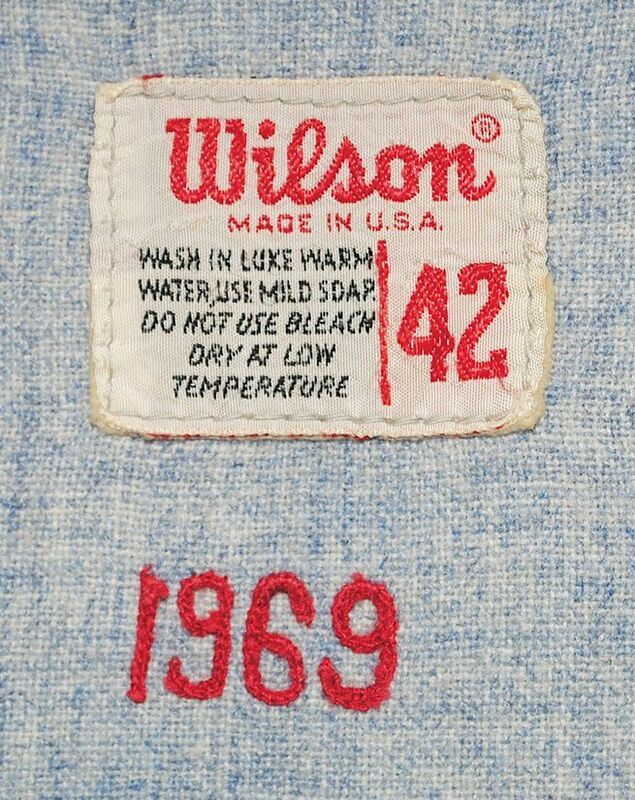 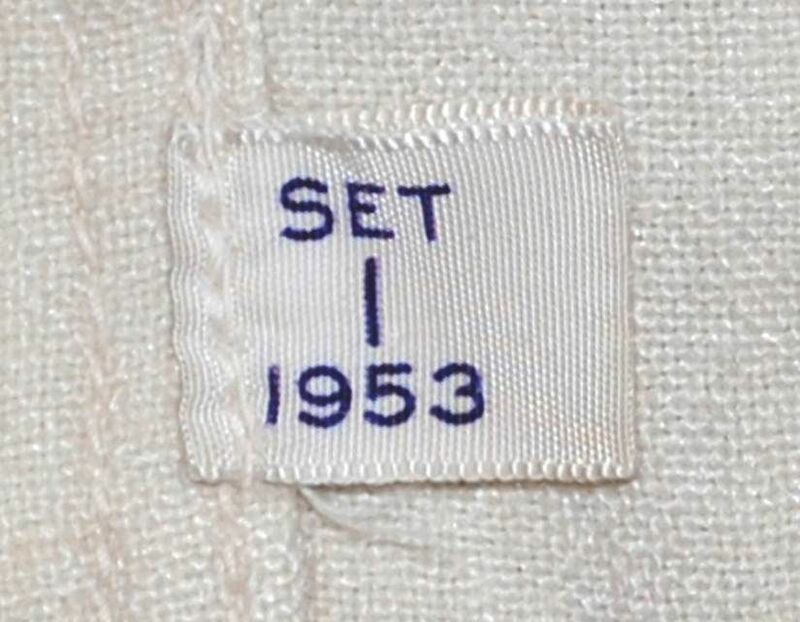 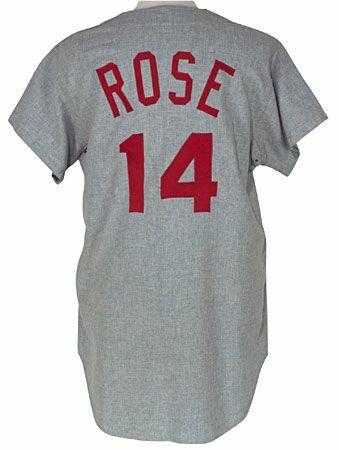 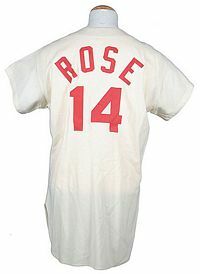 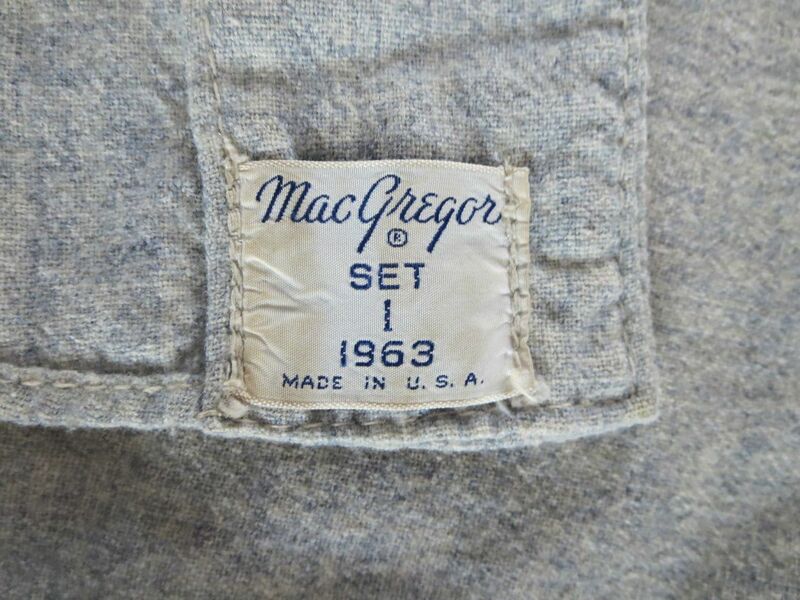 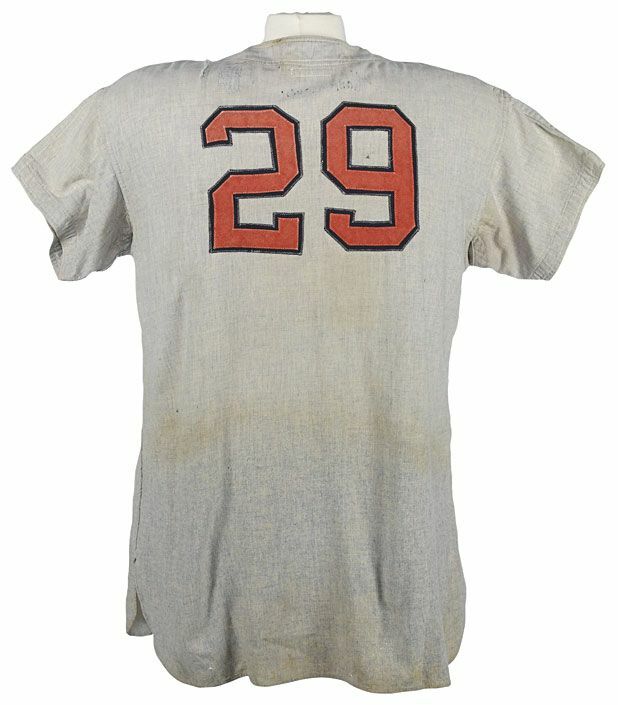 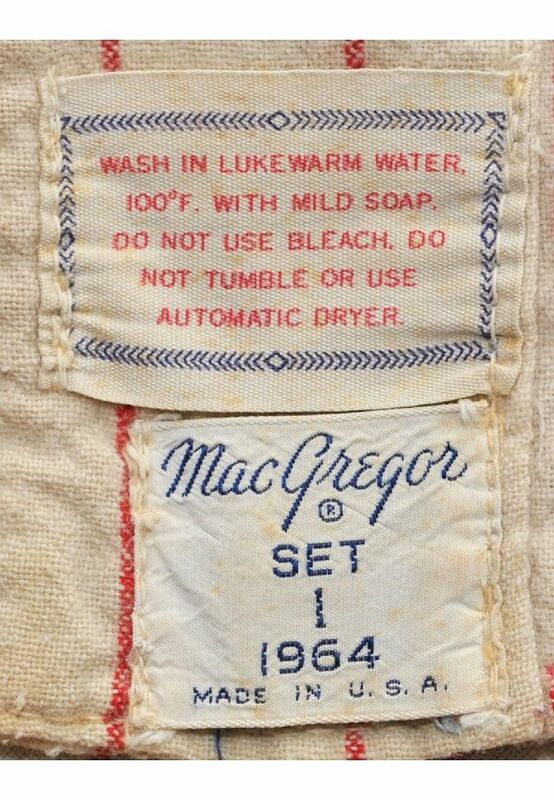 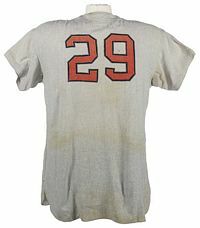 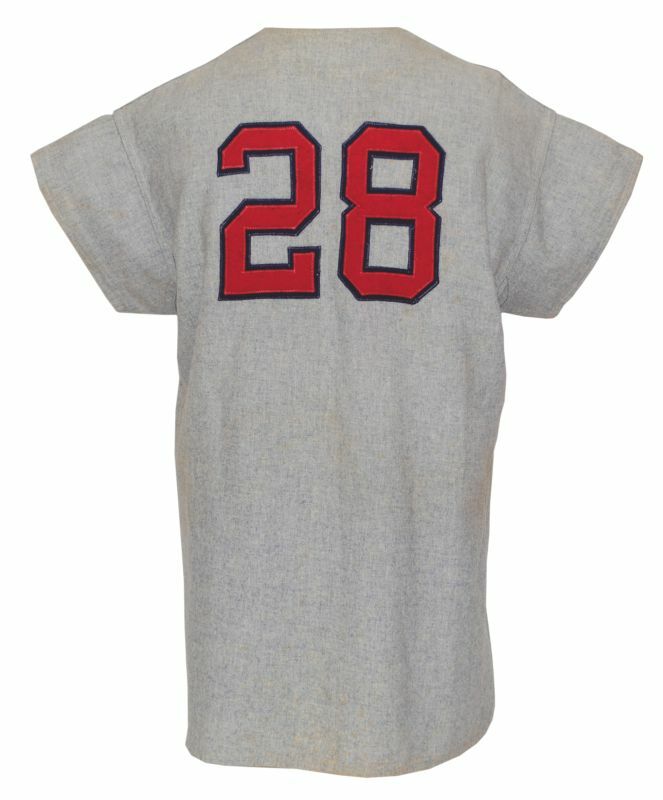 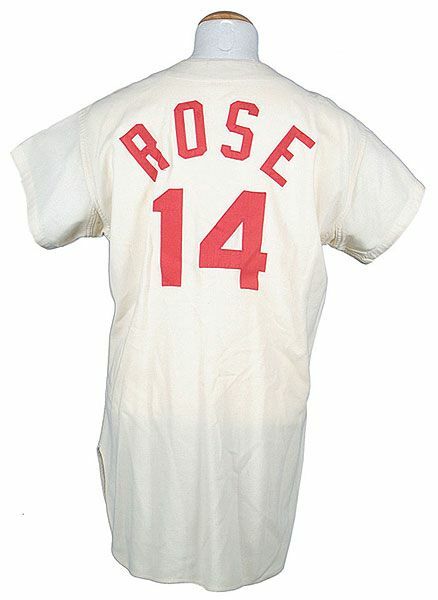 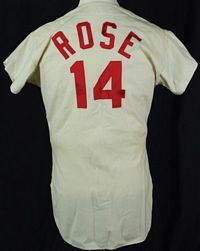 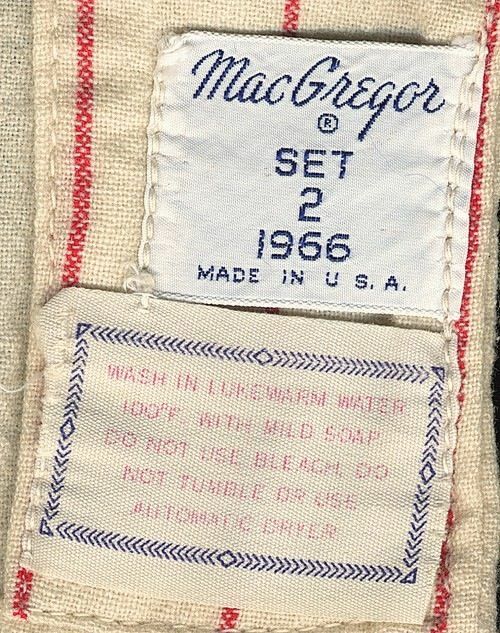 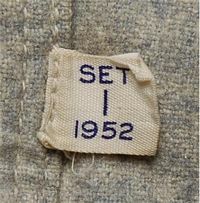 This 1963 tagged jersey was reused in 1964, the year Rose wore it. 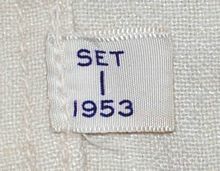 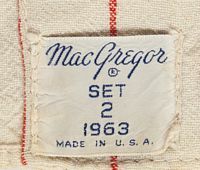 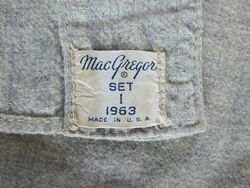 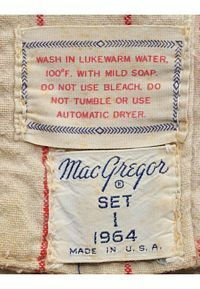 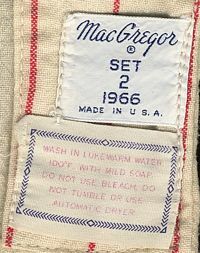 Back number was replaced by a smaller number and the name was added (since removed) for 1964 useage. Names on back appear in 1964, red w/ navy trim on homes and navy on roads. This 1966 spare was given to Bench for Spring Training 1967. 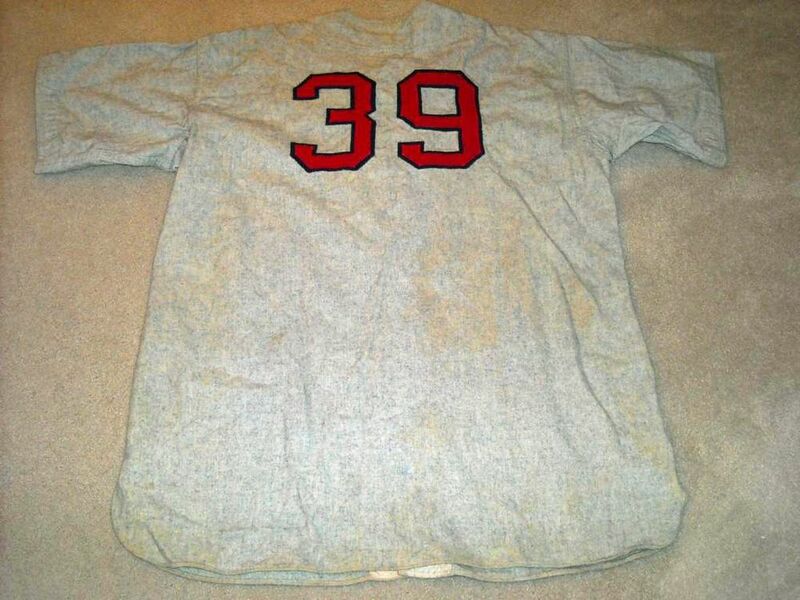 Unfortunately this one's been stripped of the front number and name on back. 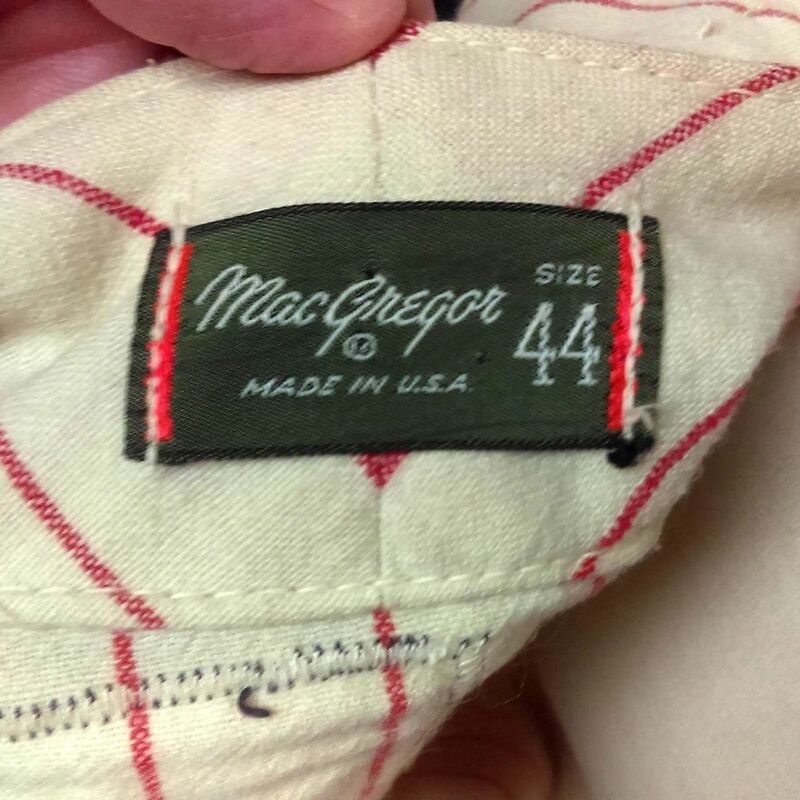 If anyone has better examples, please email. The Reds return to sleeved jerseys with this one year style. 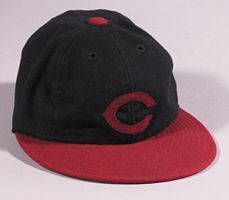 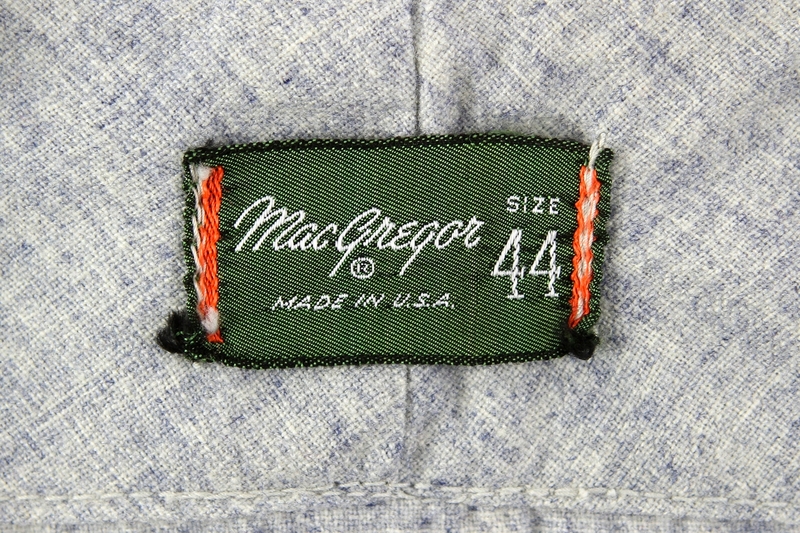 Navy is dropped, the logo returns to the famous wishbone, and the cap is based on the 1956 style. 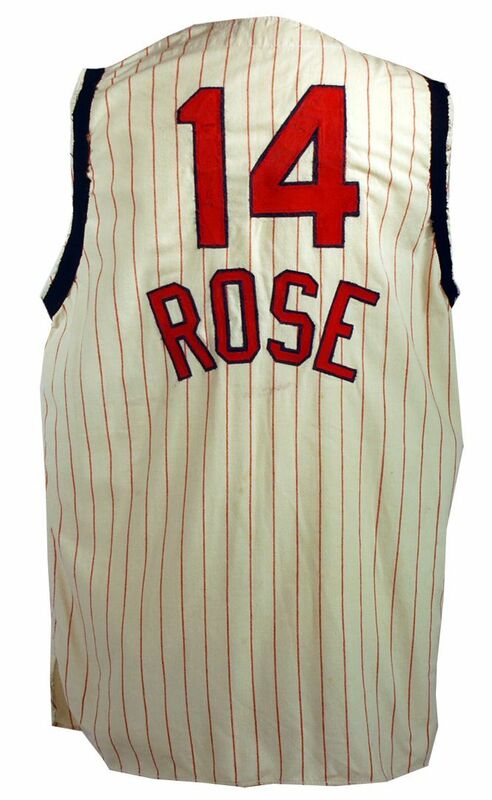 Pinstripes dropped on home jerseys. 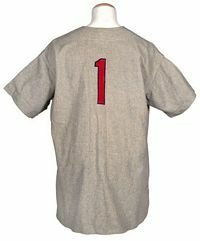 All lettering and numbers get white trim on road jerseys (front and back), and serifs are dropped. White trim is dropped from the front and back numbers and the NOB on road jerseys, remaining only on front lettering. 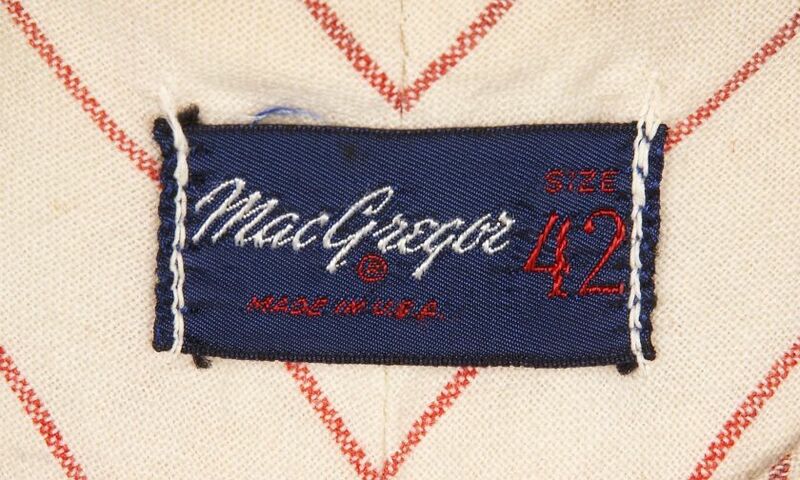 Serifs on numbers return. 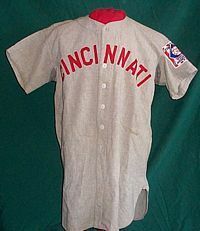 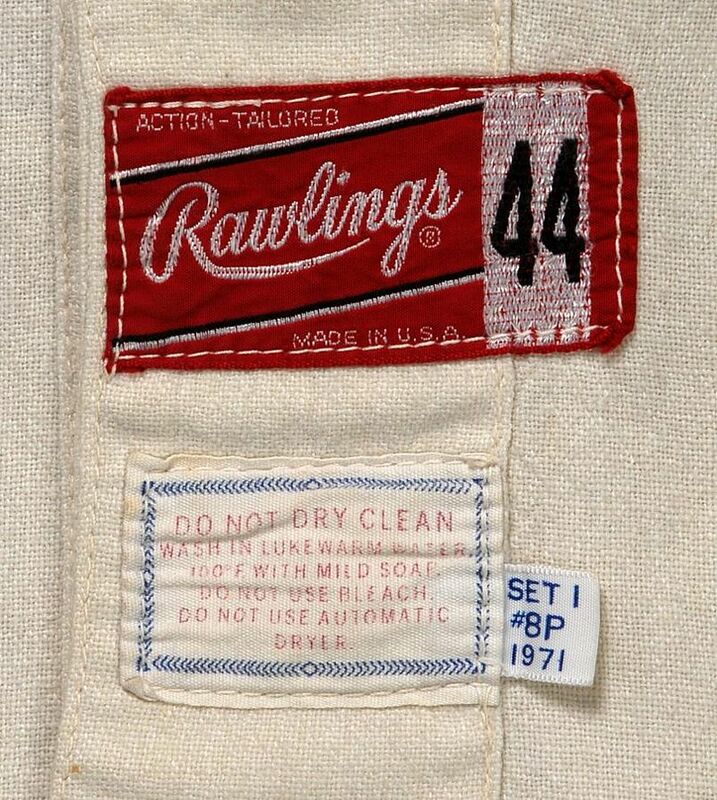 1971 jerseys were used in the 1970 World Series. White trim is removed from front lettering and is now gone completely, returning the road jersey to the 1967 look.